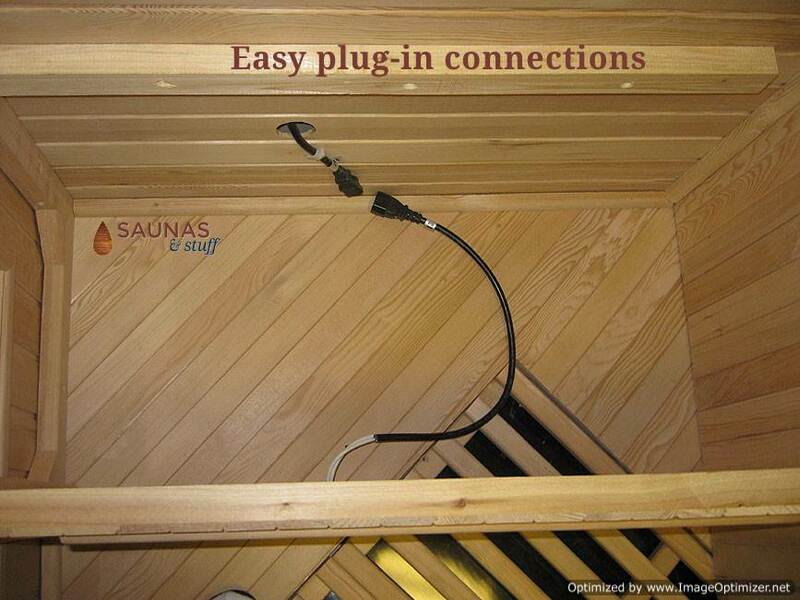 Hi Mike, I am very happy with the sauna was easy to assemble, and the CD is working. 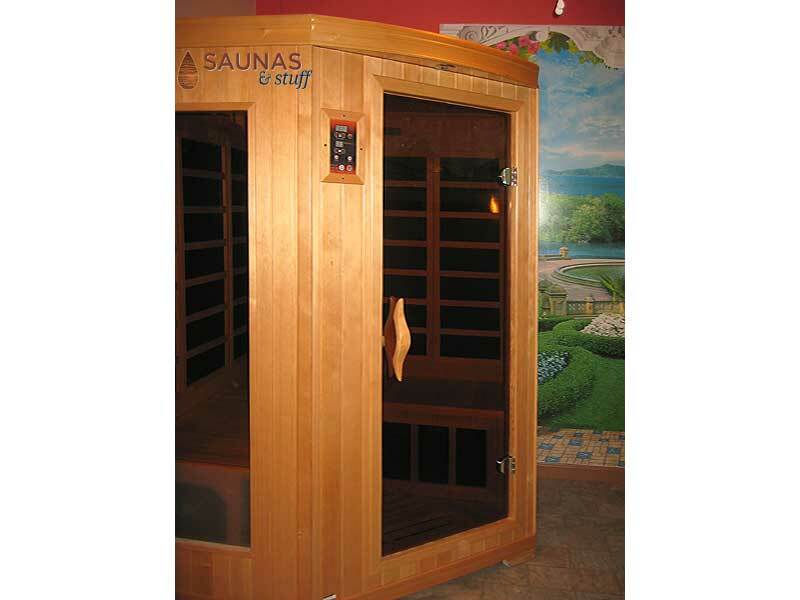 My grandchildren and I have been using the sauna every day. 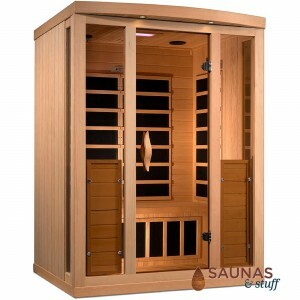 We can feel our skin is softer and lustrous we love it. 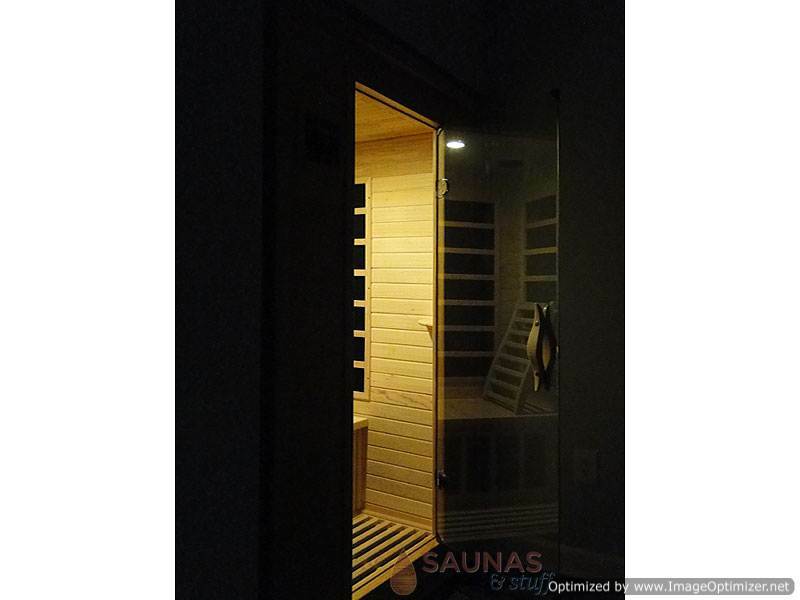 I feel that I made a good decision with the sauna. Thank you. Hi Mike. 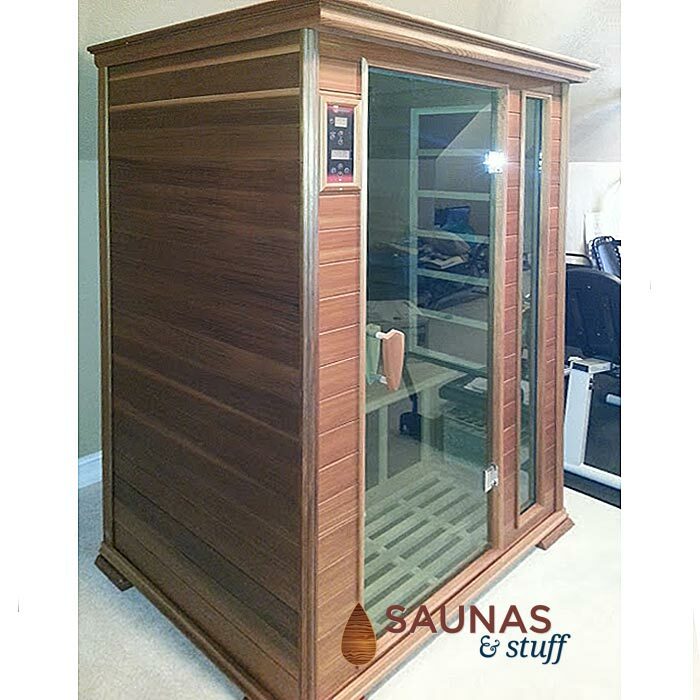 I wanted to send a couple pictures of our new sauna that was delivered this week! 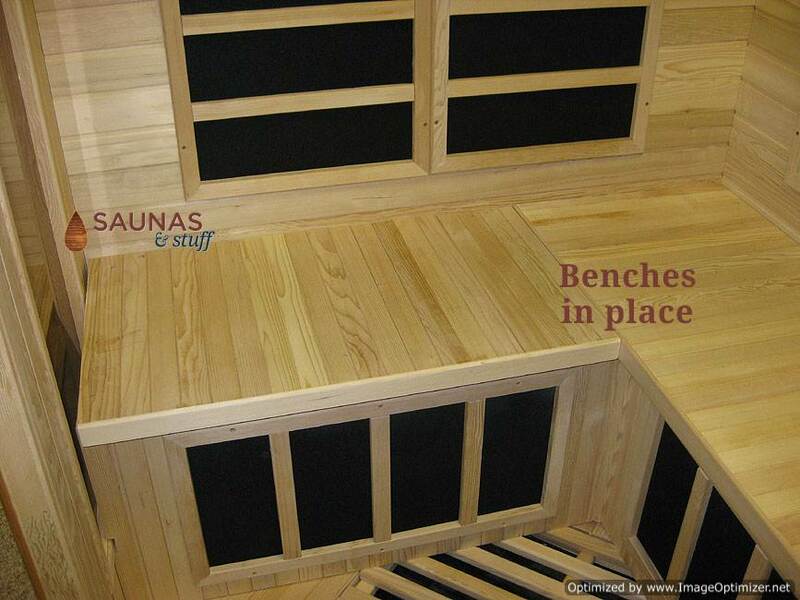 We are beyond happy with the quality, ease of use and exceptional customer service you have provided! You happily addressed all of my questions (and there were many!) 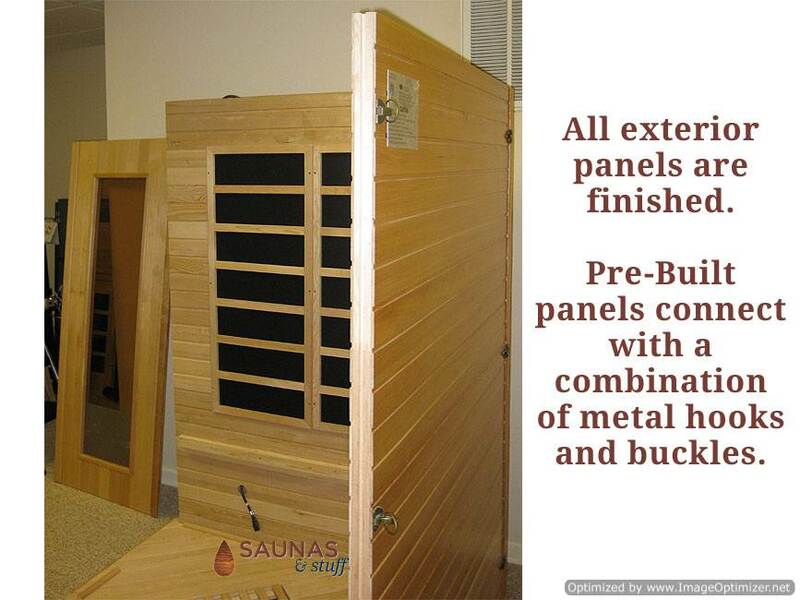 and helped me choose the perfect sauna. 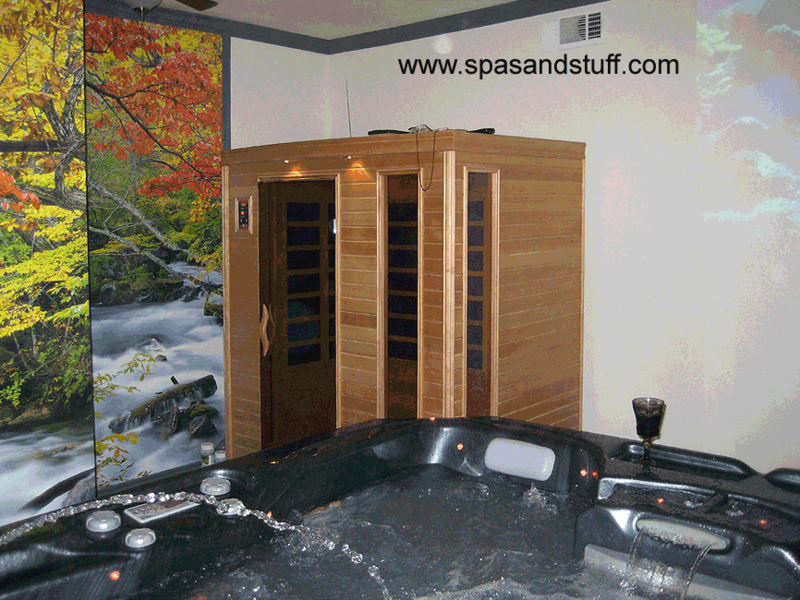 I am so happy that I went with the 3 person as I am able to stretch out and fully relax. I was skeptical to buy sight unseen but after speaking to you, it was clear that you knew your products! 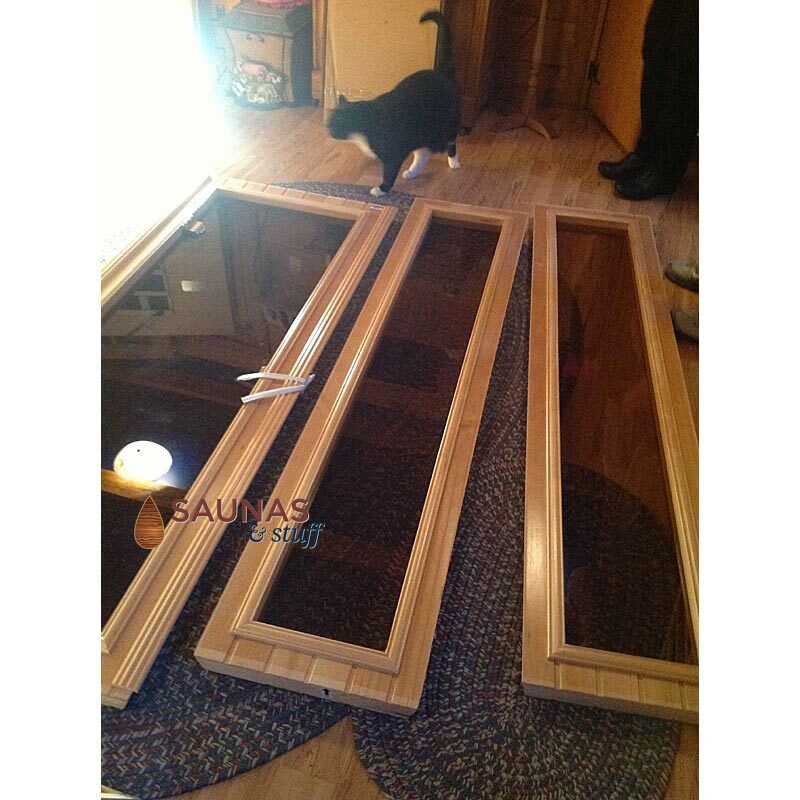 Delivery and set up were a breeze and we thank you for a wonderful buying experience. We will be sending referrals your way. Thanks again! 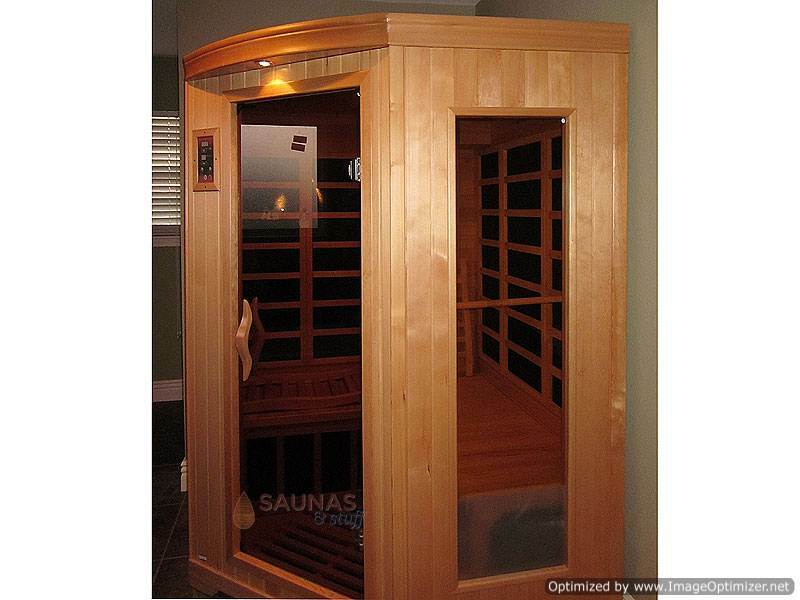 I did a lot of looking before making a call to Saunas and Stuff. 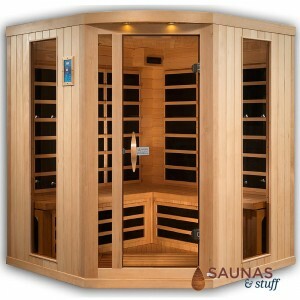 They were extremely friendly, informative and no pressure. It was refreshing. 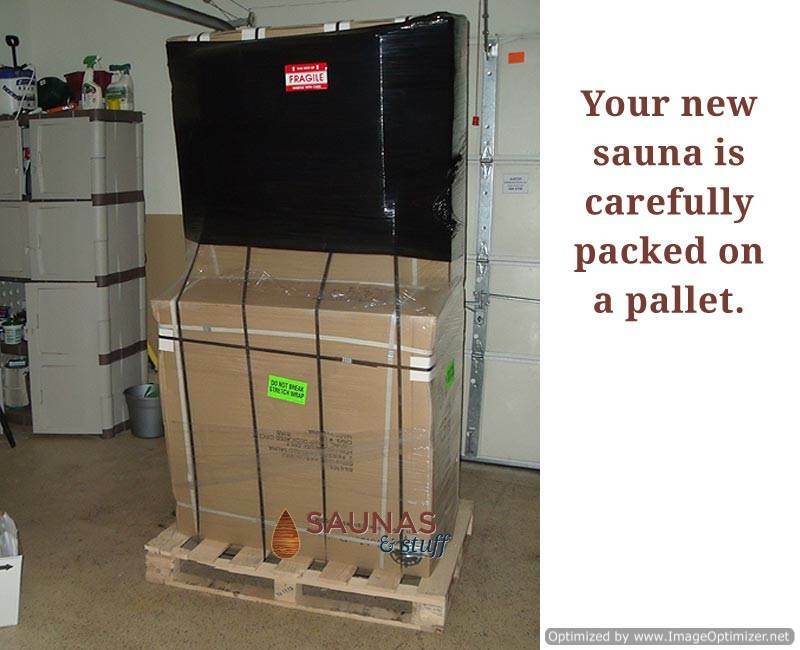 The sauna arrived quickly and was packaged excellently. 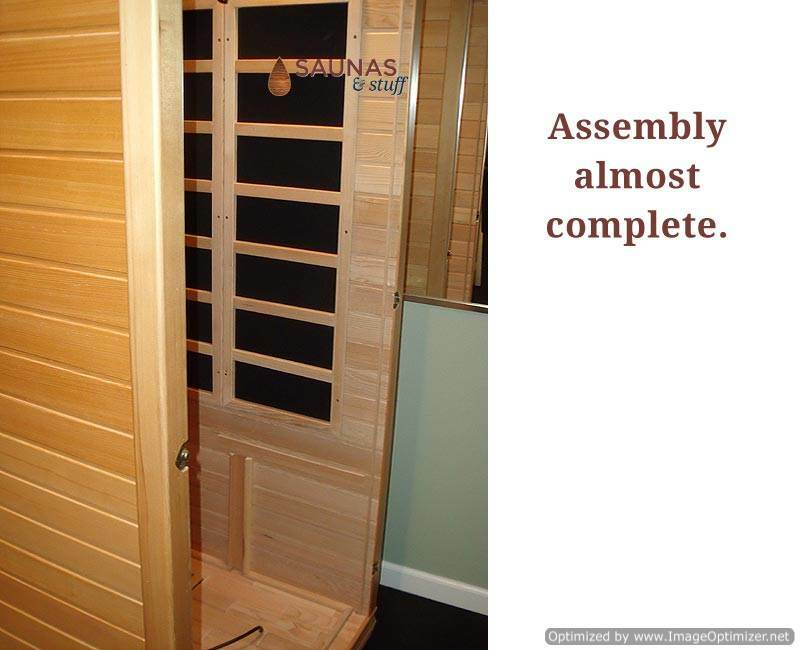 I was delayed in assembling my sauna for about a week and called Sauna and Stuff to let them know in case there was an issue. He assured me that would not be a problem. 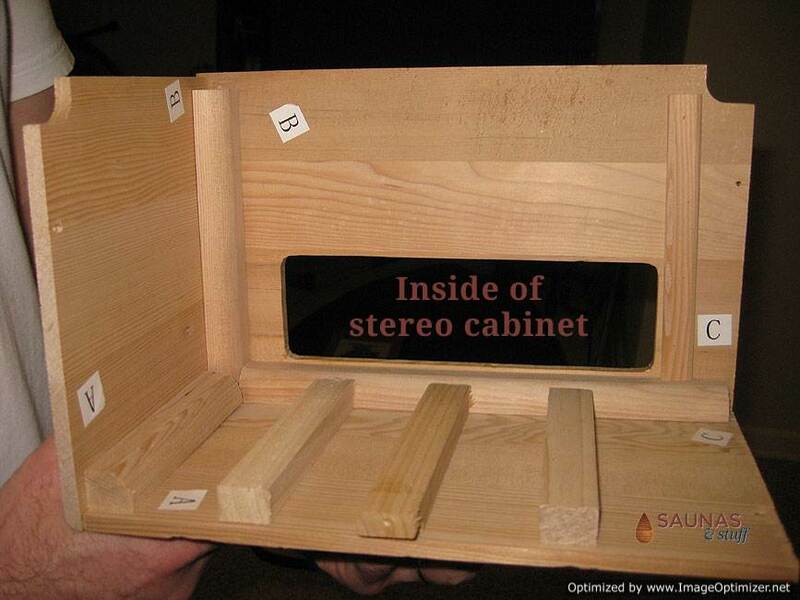 We had a couple of minor issues with missing brackets for the stereo and a broken handle for the vent. 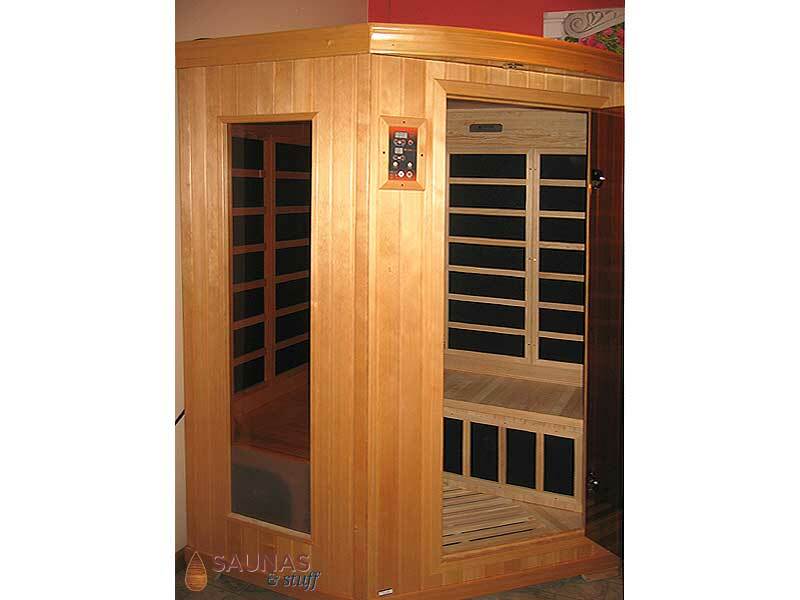 I called Sauna and Stuff and had the parts in 3 days. 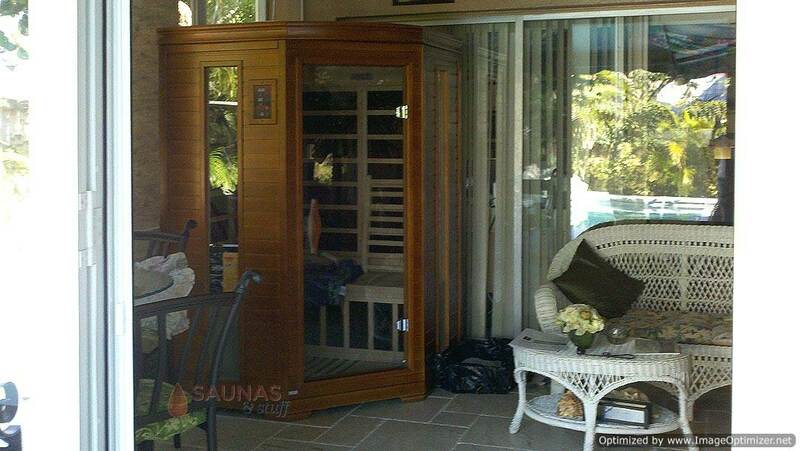 The sauna was super easy to put together and only took about an hour. As a matter of fact, my twin daughters (14) put it together themselves. 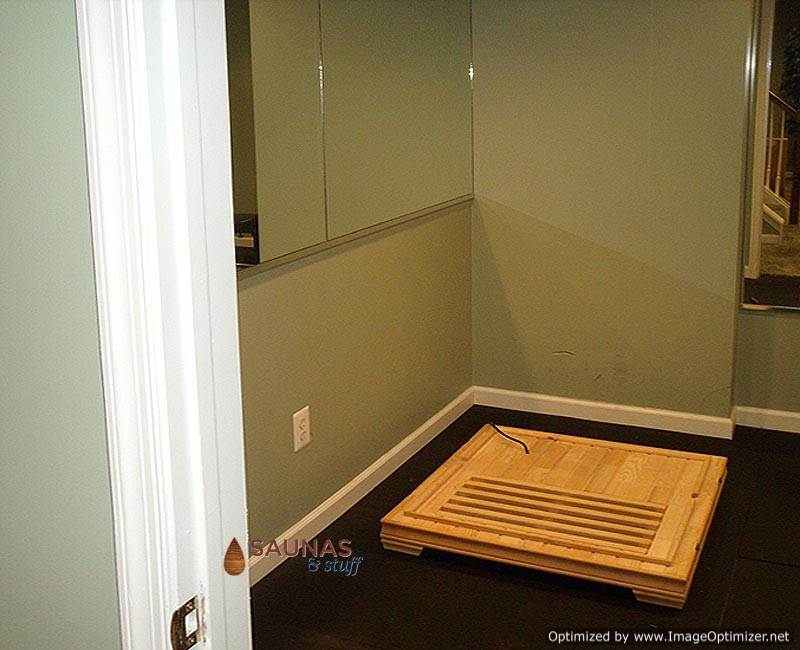 Only needing assistance with lifting the glass front panel. It is beautiful! 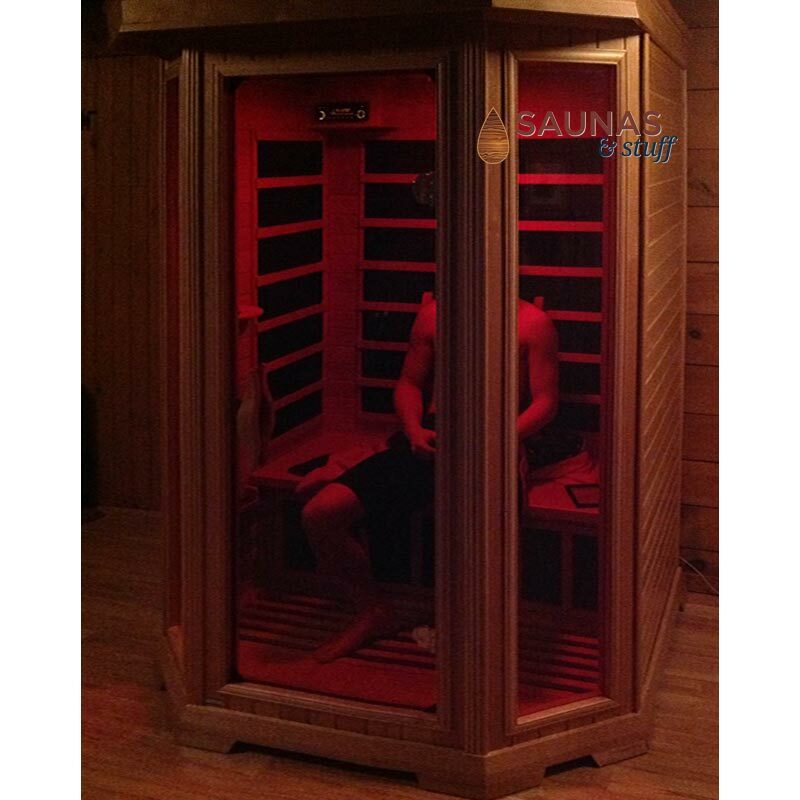 There is plenty of room for the 4 of us, it heats up quickly, the stereo is a nice feature and I really enjoy the Chromotherapy lighting. 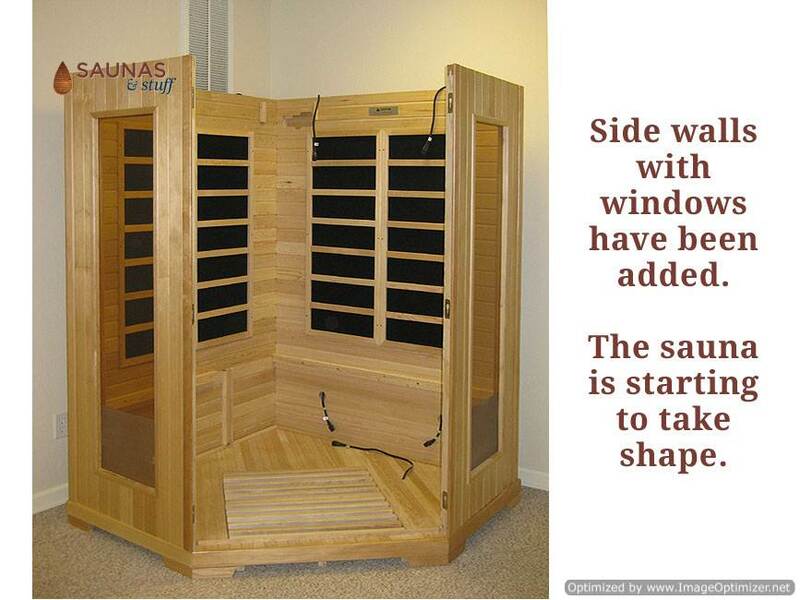 I have been using the sauna every other day since I got it. My kids use it also. 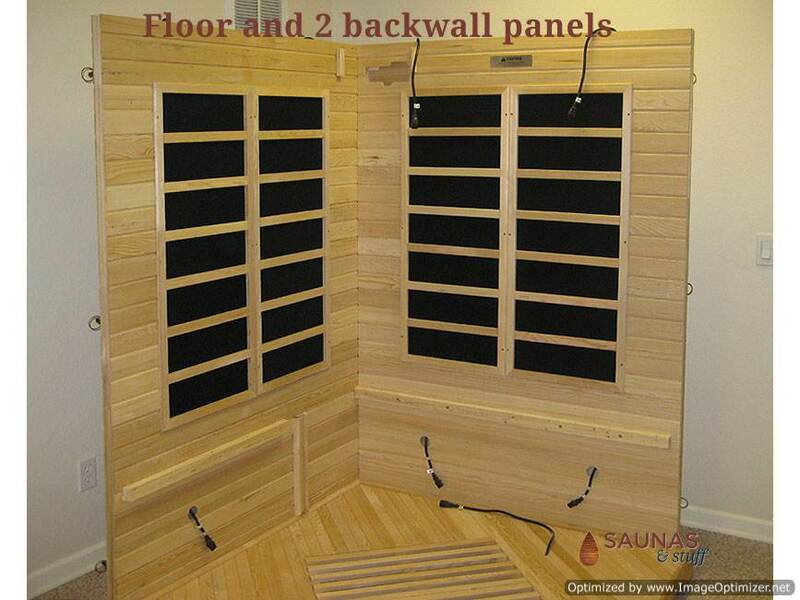 I would encourage anyone considering purchasing an infared sauna to give Saunas and Stuff a call. You will not be dissappointed. 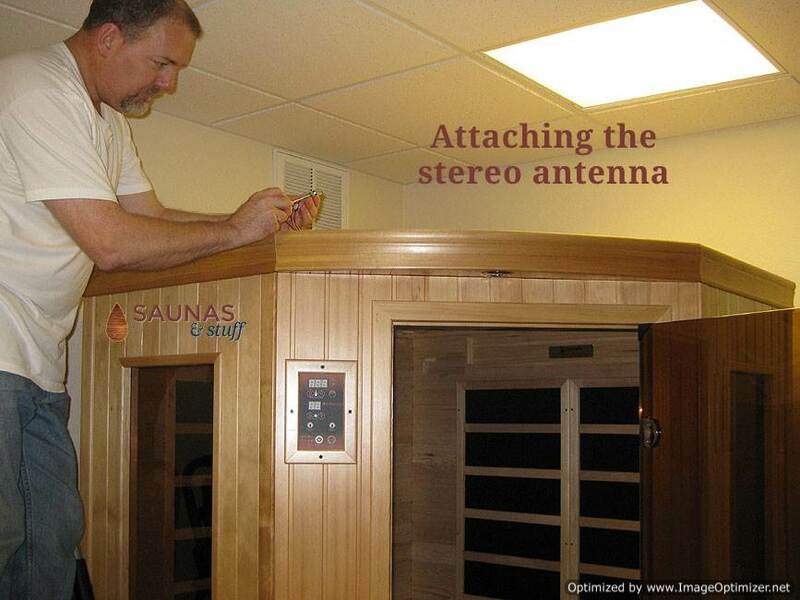 Mike, putting the sauna together was a snap and I had more than enough ceiling clearance. The only issue was the broken pin on the amp plug which you took care of expeditiously and promptly (and over a holiday I might add!) - thank you very much! Tremendous customer service! 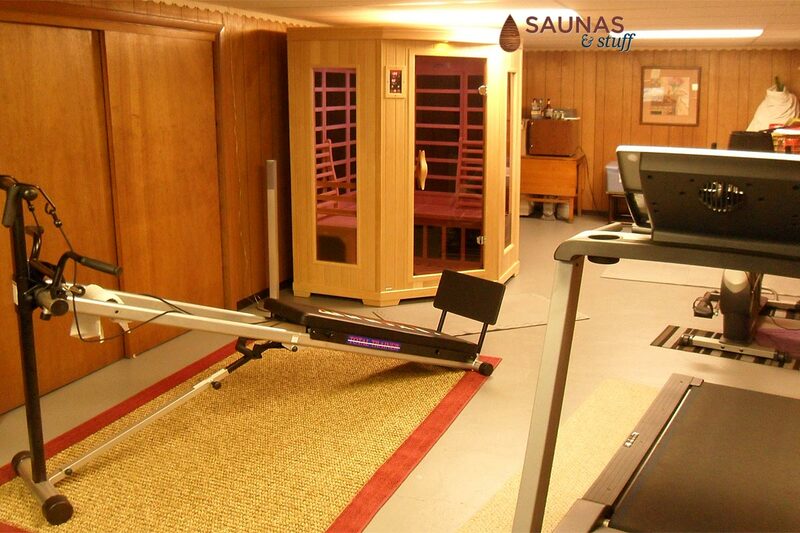 As you can see from the pictures, we've placed it in our workout room in the basement. 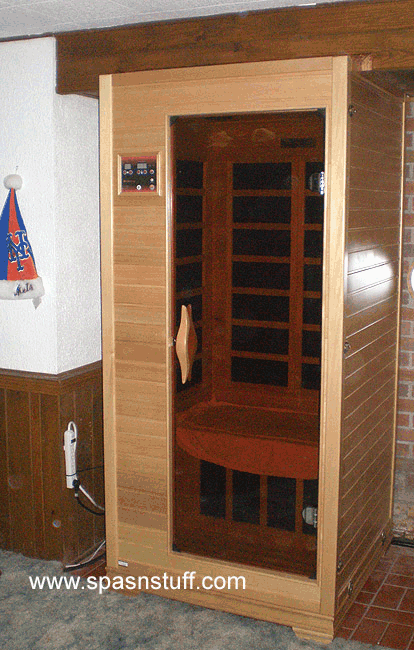 We use the unit practically every day if not twice. 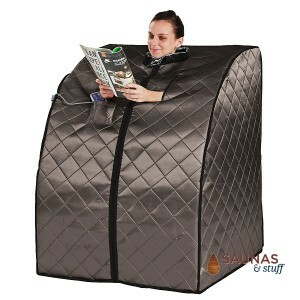 My wife is already feeling the health benefits from using it. 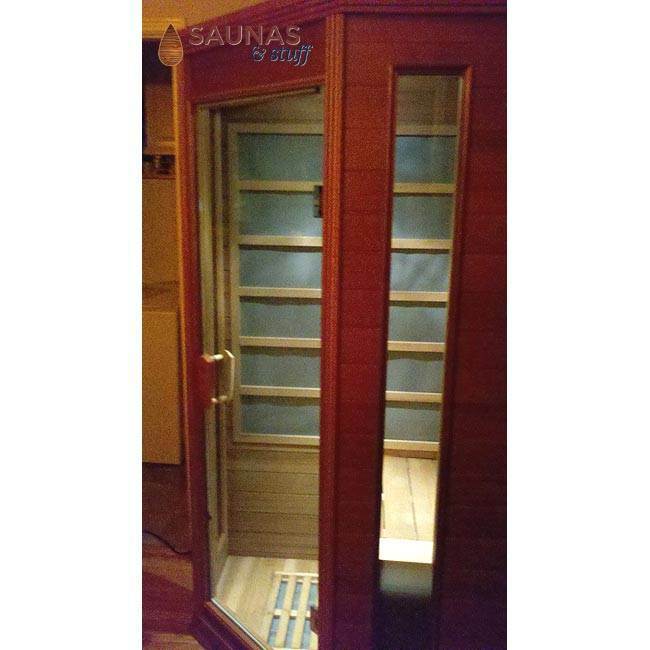 We love using it very much. Thanks again! 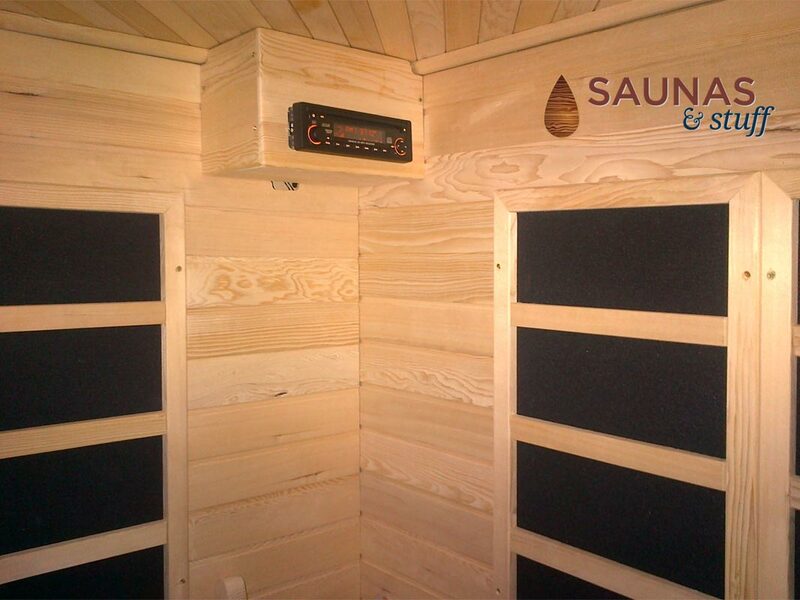 We just got our sauna the other day. 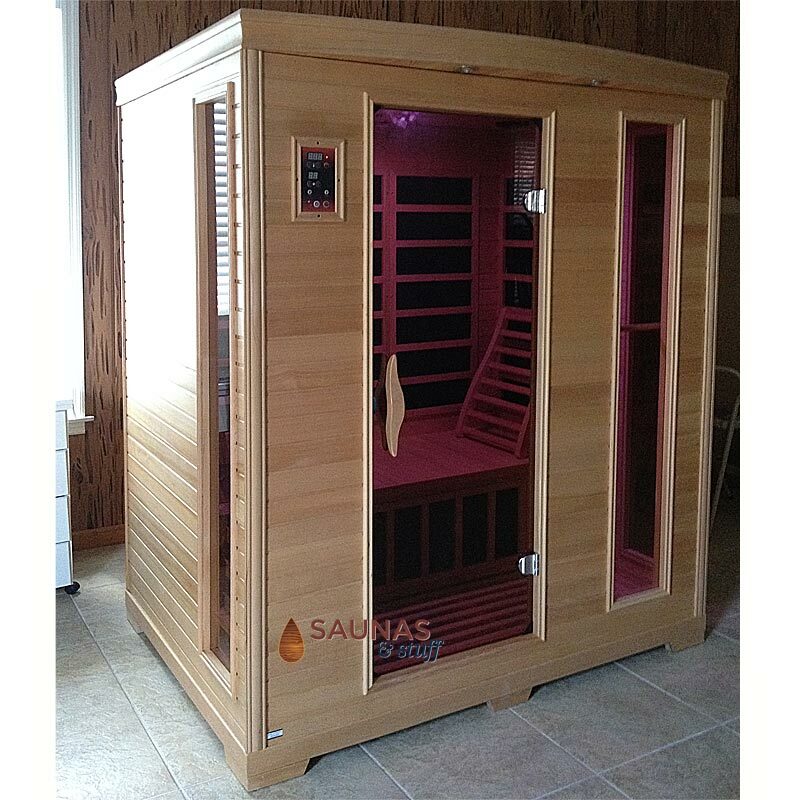 Note to self: if you order a sauna during mud season in the northeast and it comes in the 5-10 days as advertised, you have to figure out alternative delivery as the roads are weight posted. 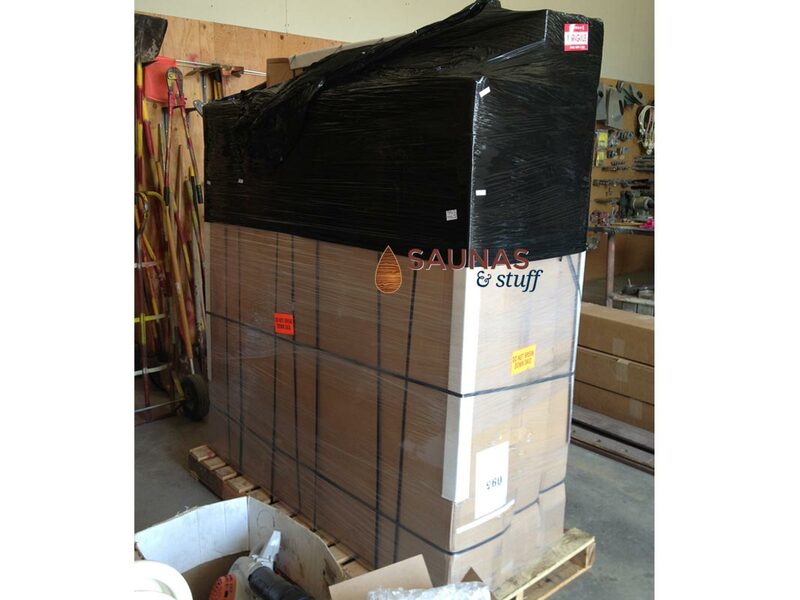 The shipper was very accommodating and I decided to pick it up from the warehouse about 30 minutes away rather than them holding it upwards of 4-5 weeks. next time i'll order at a different time of year. It took us a little longer than an hour to set up, mostly as we were more interested in telling each other what to do rather than listening! 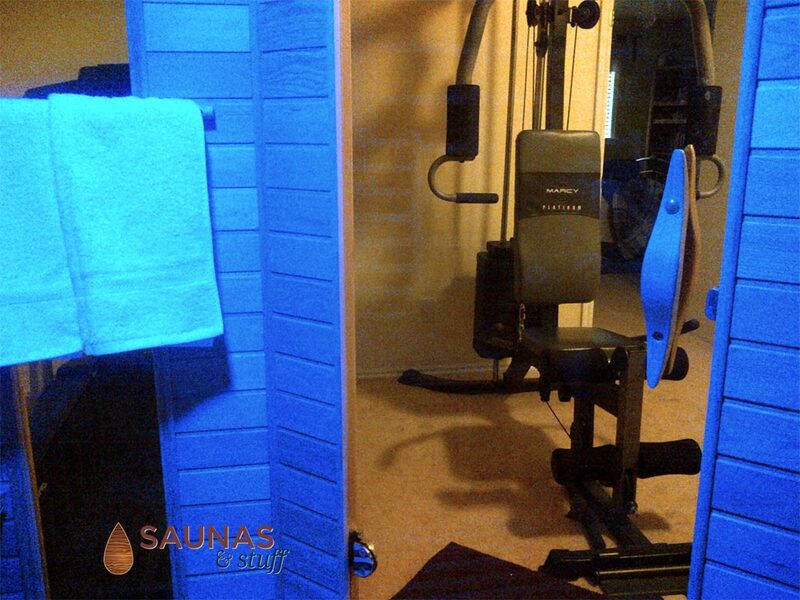 Everyone has tried it out and we're loving it! Thanks so much! 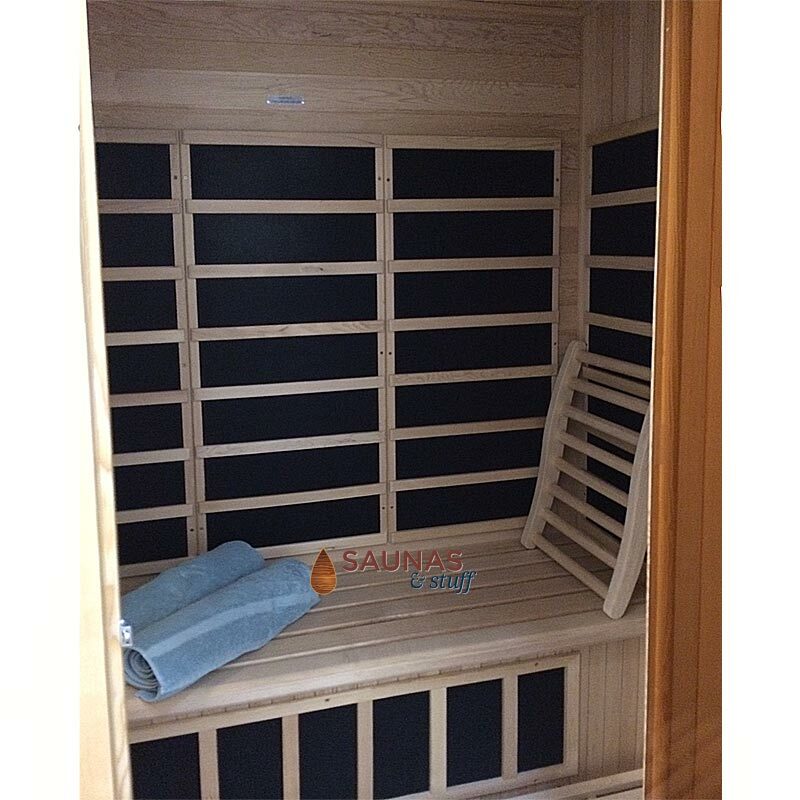 We love our new sauna. 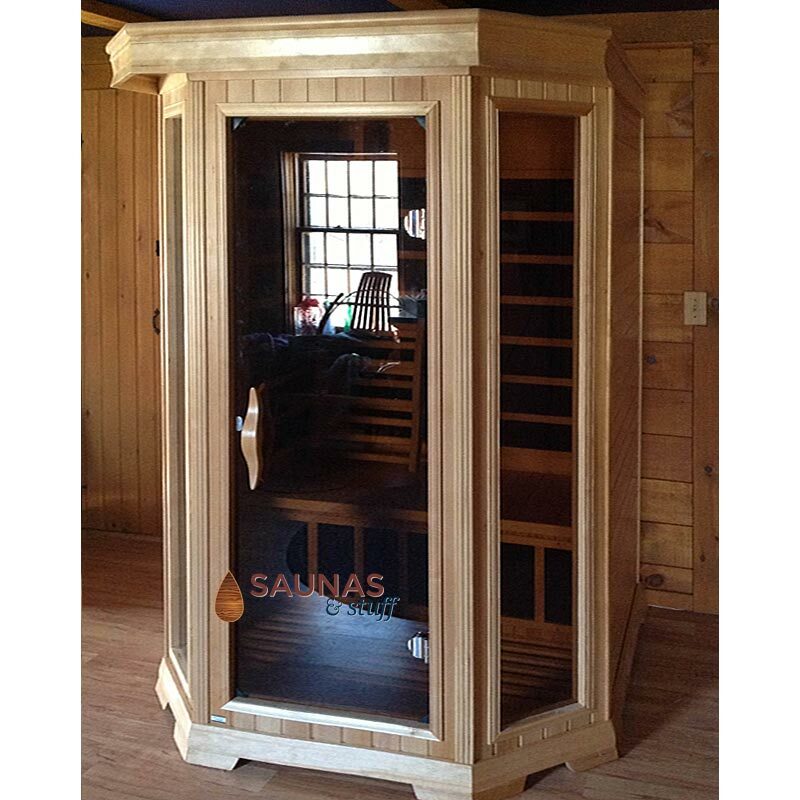 I was so impressed by the craftsmanship and attention to every detail. The unit was so carefully packaged that I don't think anything could have happen to it in shipping. It was very easy to assemble (less than 30 minutes with two people). Every year, my wife gets poison ivy while working in her plantings and she usually suffers with it for several weeks because it just spreads on her arms, legs and sometimes her face. Many years she has had to go to the doctor for prescription medicine. As usual, she got her annual case of poison ivy. 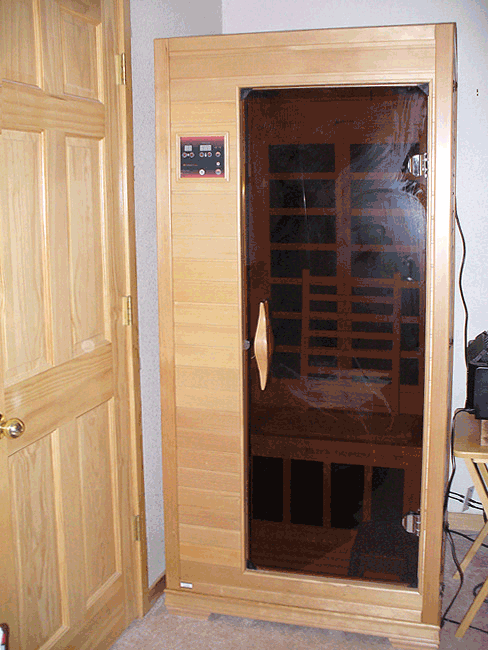 I told her to try the sauna, reluctantly she did and the poison did not spread like in past years. 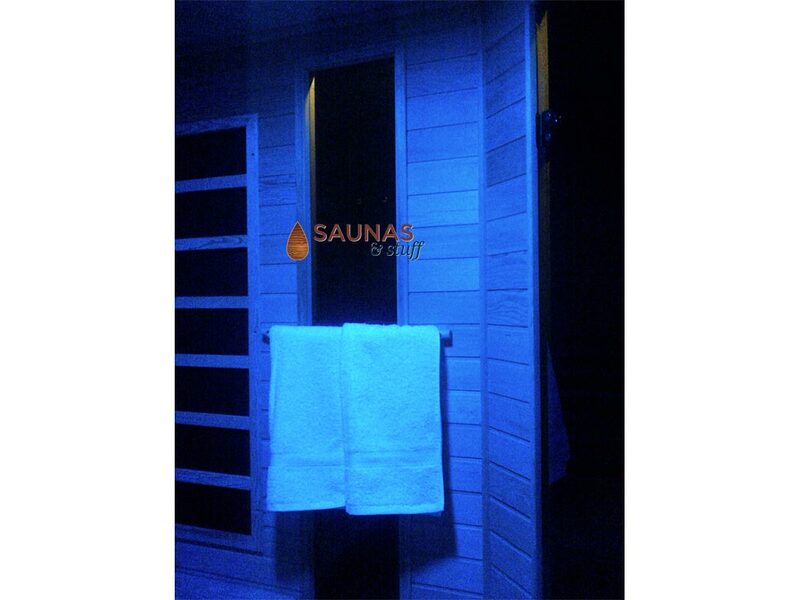 She has two small patches on her wrists and within 3-4 days of using the sauna, the patches were drying up. 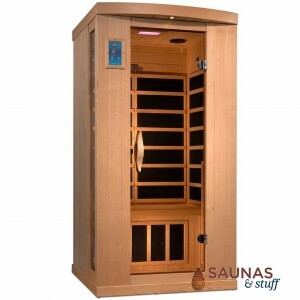 She was worried that by getting so hot in sauna would just make her itch and scratch more, but she really didn't scratch much at all. 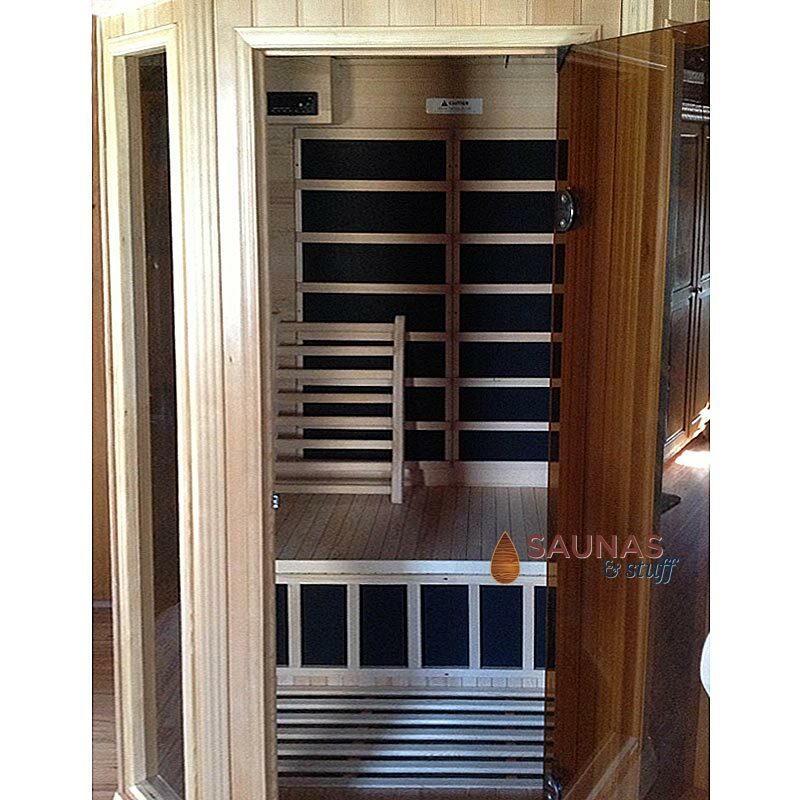 Well this experience has really sold her on the sauna and she uses it regularly. Mike, I apologize for the lateness of this, but I have been traveling a lot for work. Please feel free to post this on the web site. You guys were great to me. 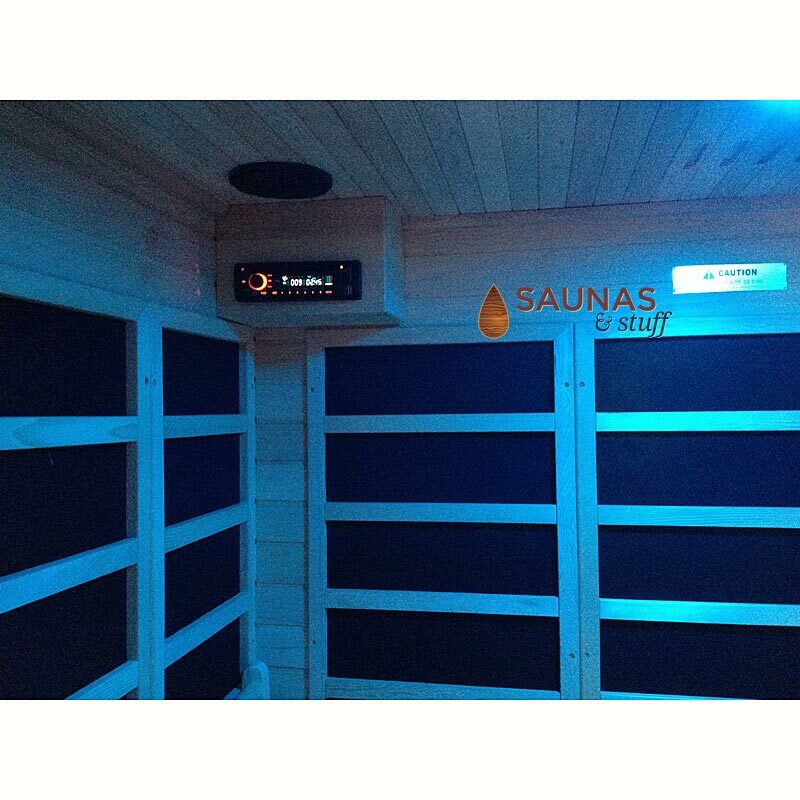 "The service at Saunas and Stuff was amazing. More companies should be just like you. 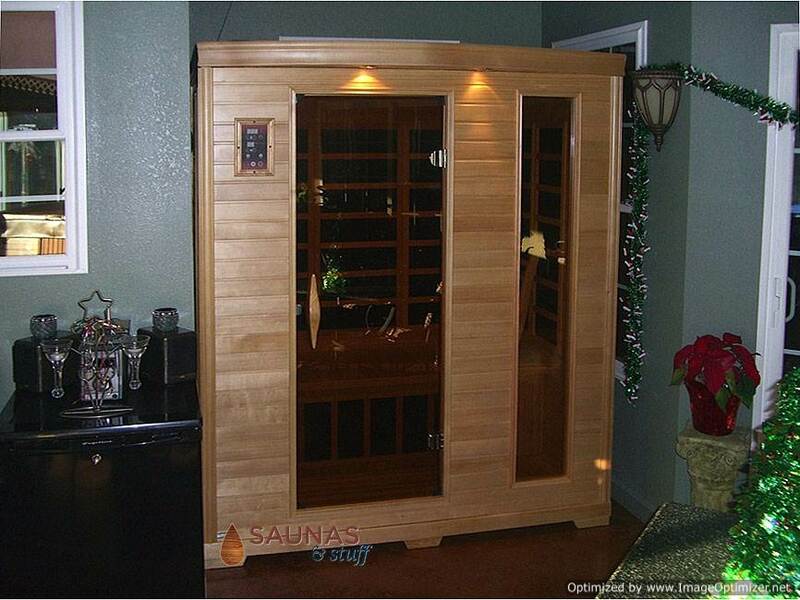 The sauna was a breeze to put together, and the free shipping was especially nice. 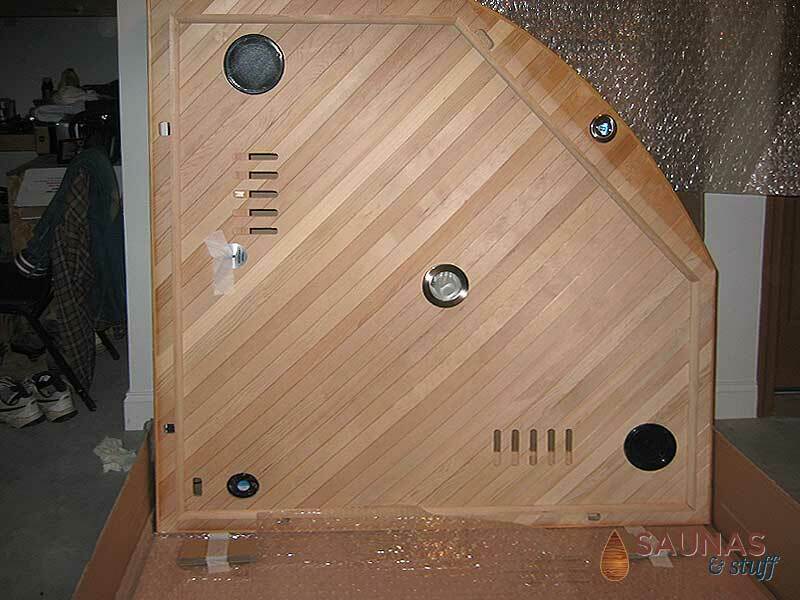 We had a bad electrical panel that was sent, but Mike and his staff helped us pinpoint the problem and sent us replacement parts very quickly. 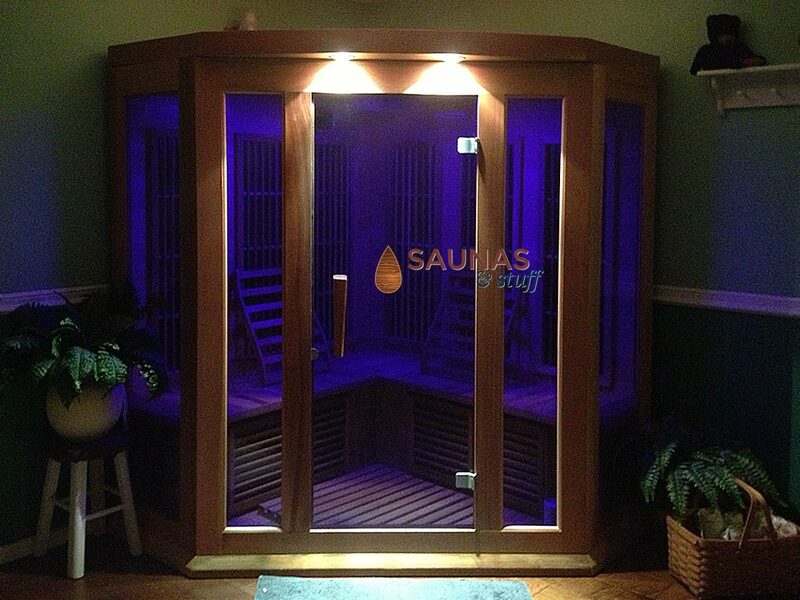 The sauna is up and running now and works like a charm. 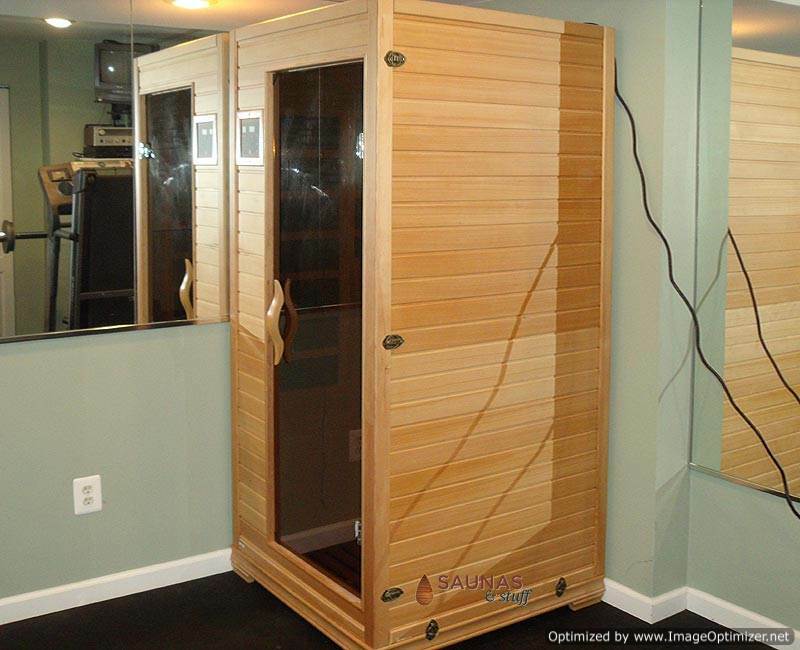 It's in my condo basement and is positioned so I can sweat out all my toxins and cellulite and watch tv at the same time. 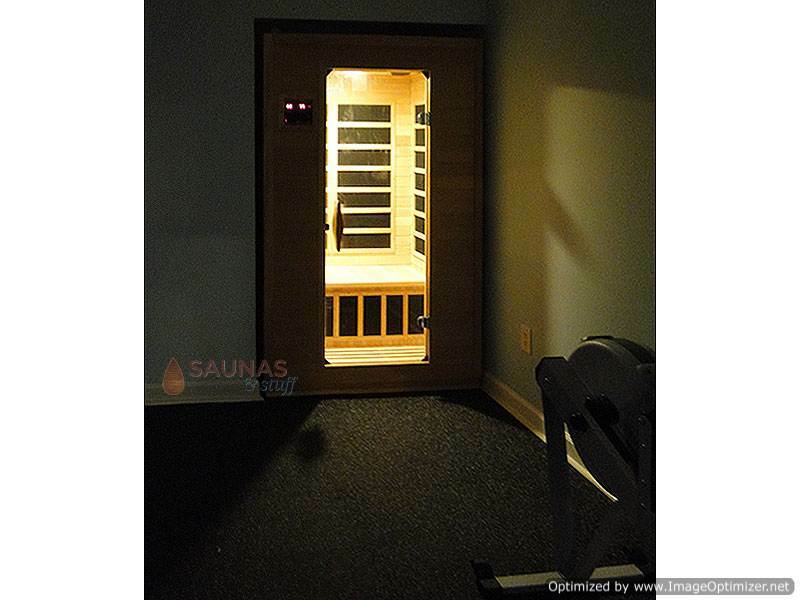 I would recommend Saunas and Stuff to anyone. 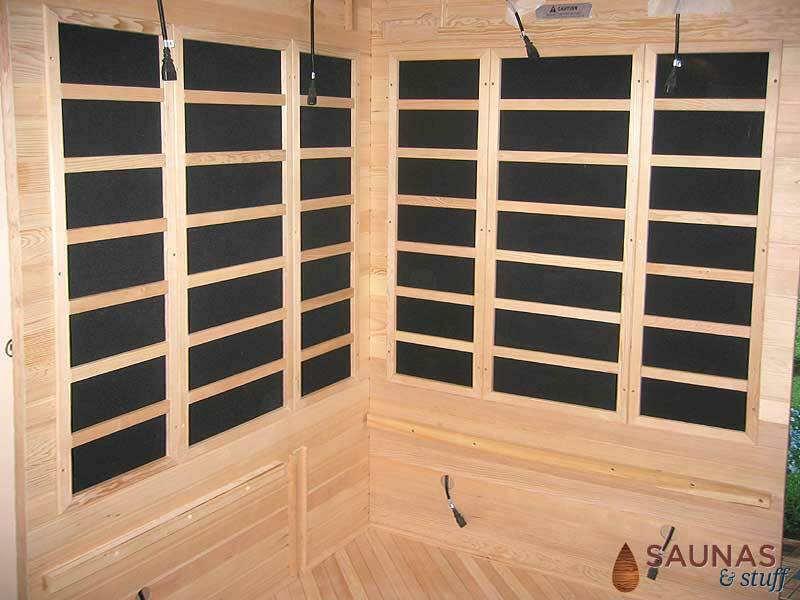 A sauna is a great way to destress and to help fight infections and kill bacteria in your body." 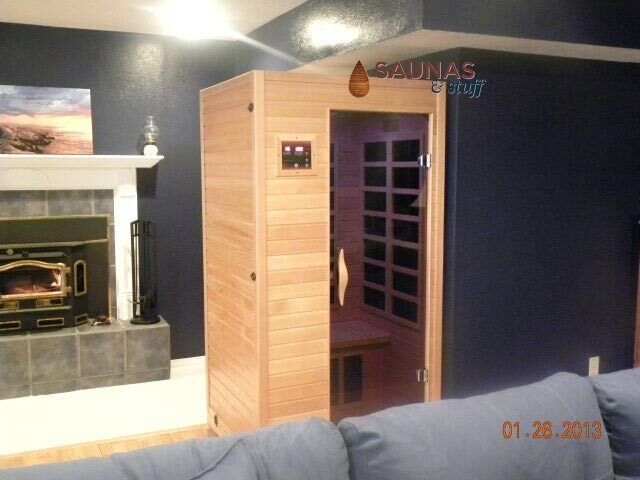 Just setup our new sauna in our basement rec room - took about 45 minutes to an hour with two people. 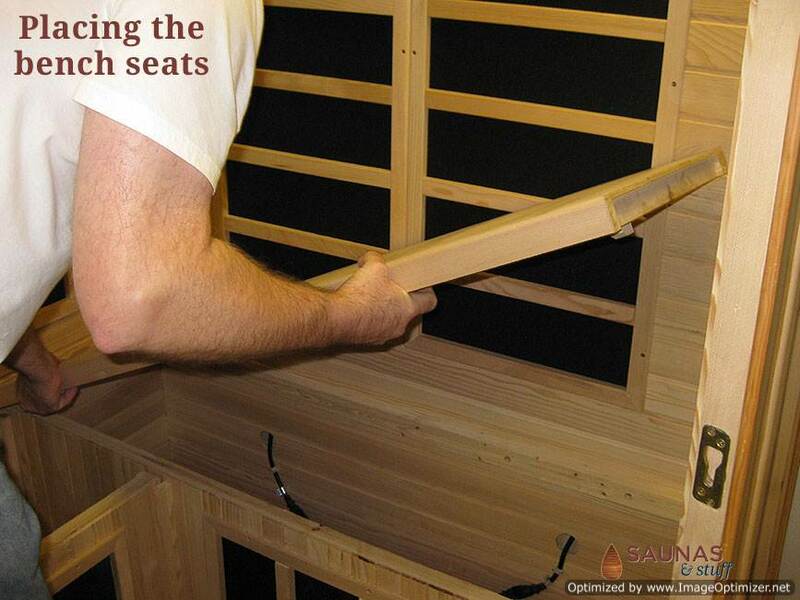 Very easy to put together and instructions were easy and right on. 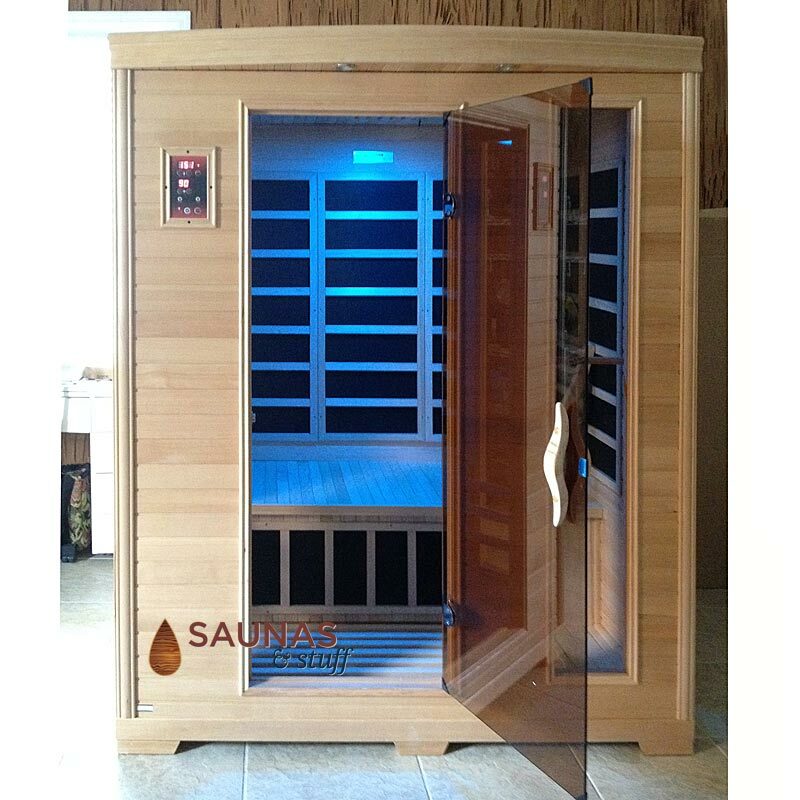 We used to pay to take infrared saunas across town - now the whole family can take advantage and never have to leave home. 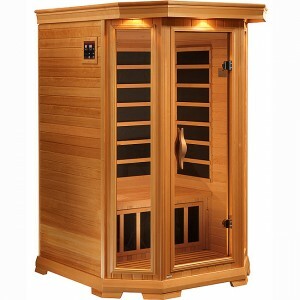 Best investment I have ever made in my family's health! Wow! Last Saturday we spoke (1st time ever) with Mike in Florida by phone from our Rocky Mountain home. 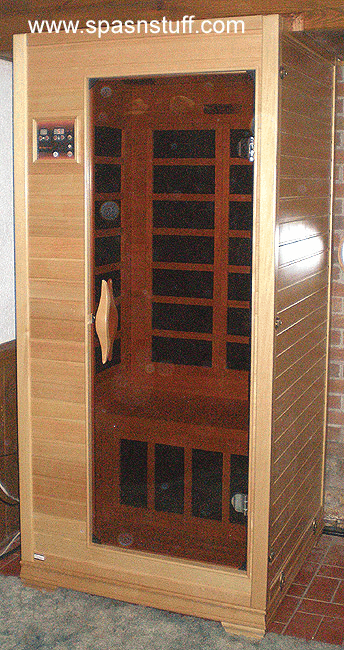 Wednesday our new sauna was delivered directly from California, and this morning (less than a week after first calling Mike) we enjoyed the benefits of 130 degrees of warmth and chromotherapy together! A helpful electrician ran a dedicated line, put an extra breaker in the electrical panel and a dedicated 20 amp surge protector. 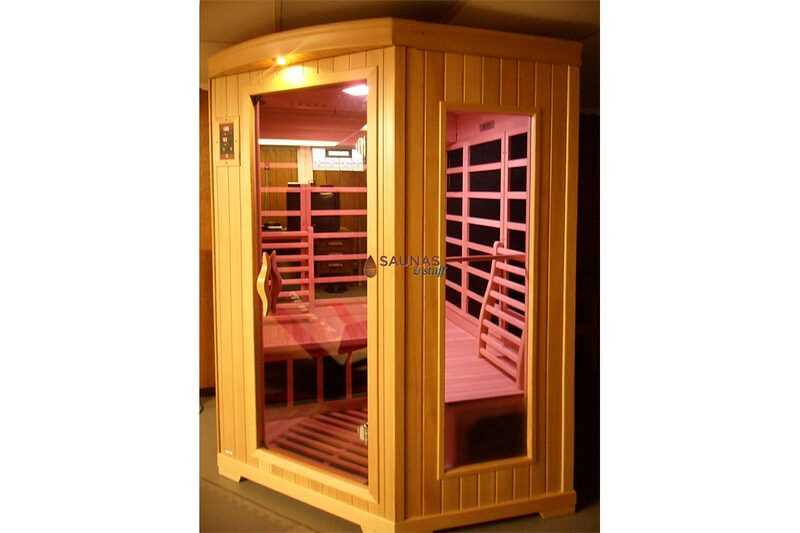 (Larger infrared saunas need a 20 amp outlet). Our teenage son's friend last night exclaimed: "Wow, your home just got way cooler." (I think he meant warmer or perhaps "hot"). 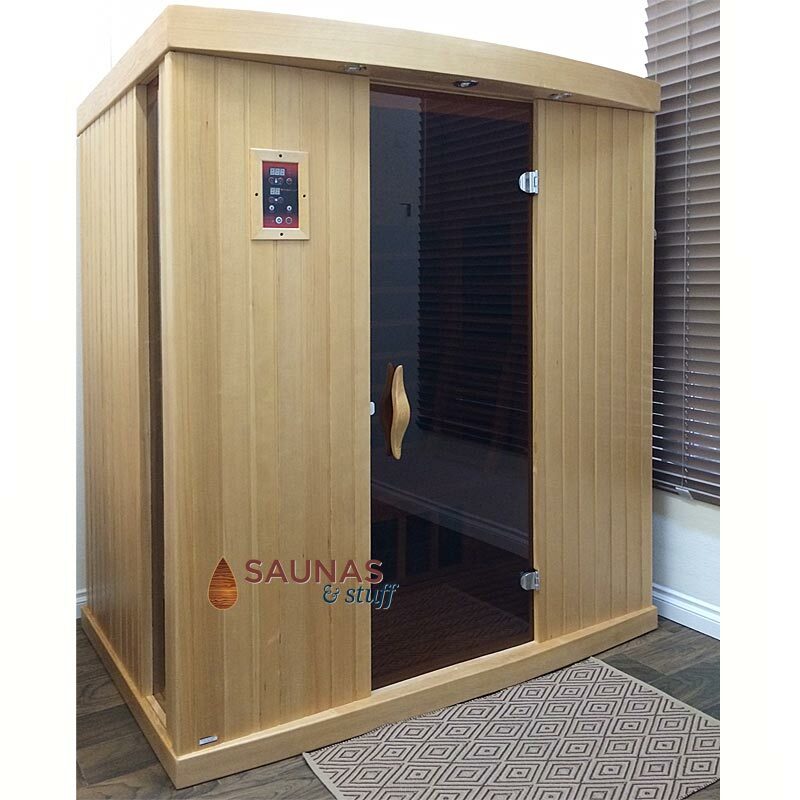 We started out looking at this Golden Design line of saunas because of a very small one my wife saw at Costco, and I quickly learned that the larger 66x66 corner unit is perfect for our use, and the best value I found anywhere after several hours of phone calls and internet research. And, others talked of 2-3 weeks delay at higher prices. Thanks Mike! 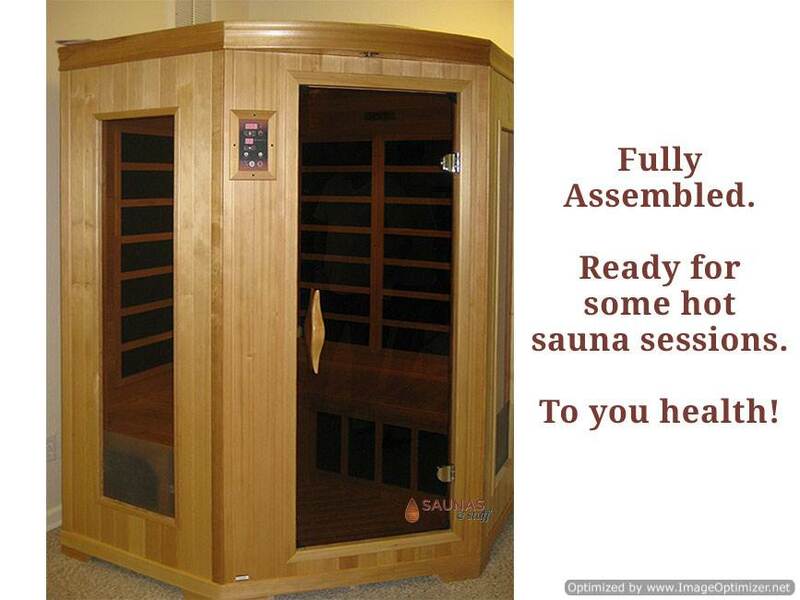 Hi Mike, our sauna is assembled and in service. 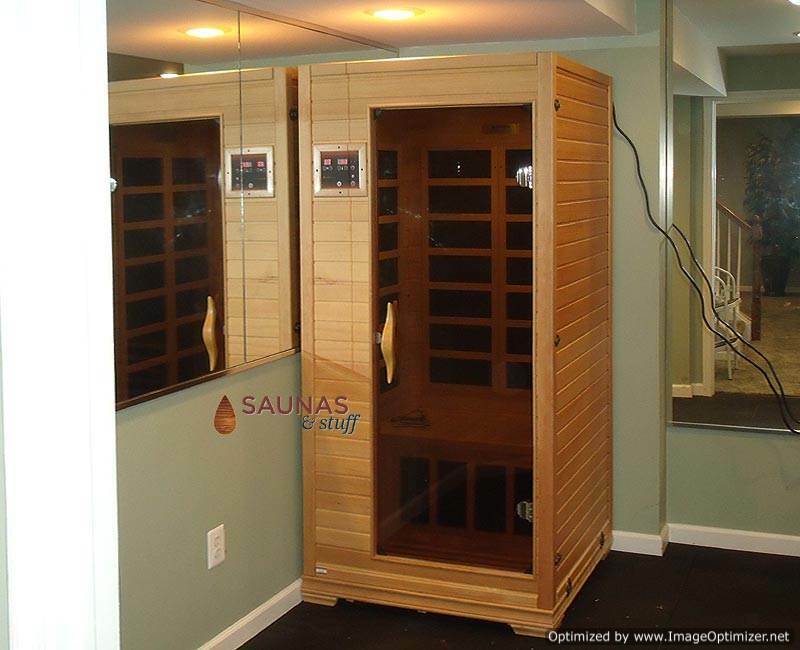 It is absolutely beautiful and we were really impressed at the quality of construction and how well the instructions were written. Everything fit perfectly! 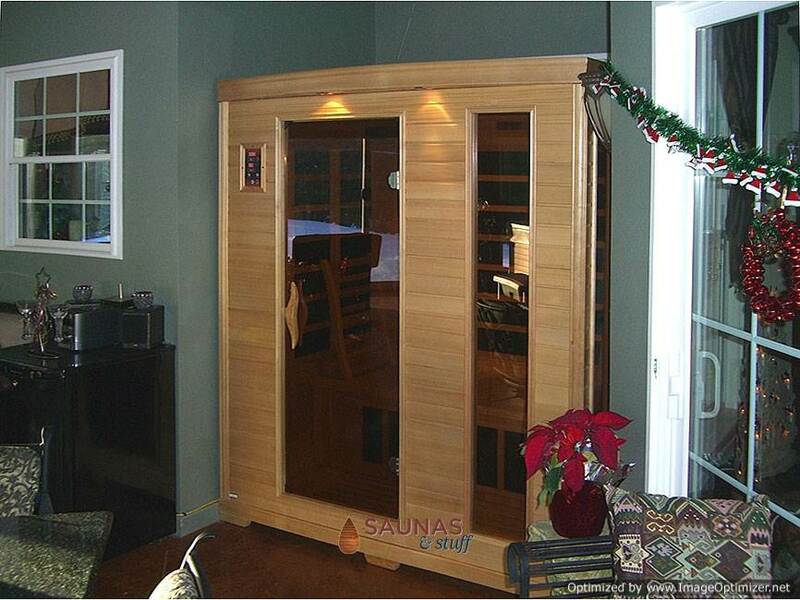 Pictured here is a very nice example of how beautiful an Infrared Sauna can look as part of a home bathroom. 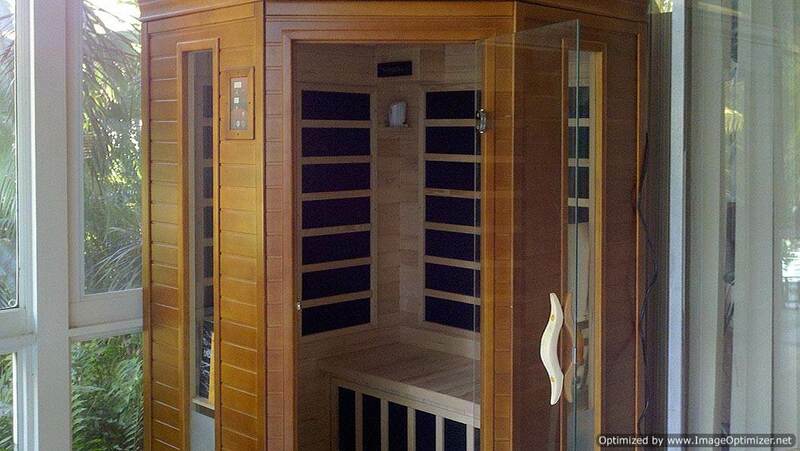 The perfect way to remove stress and get healthy at home. 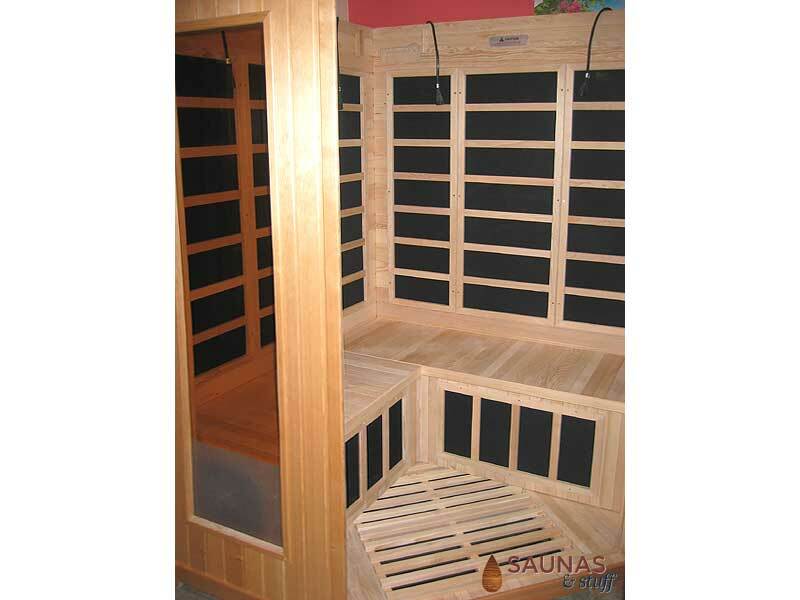 Hi Mike, I put the sauna together which was very easy and it works great. 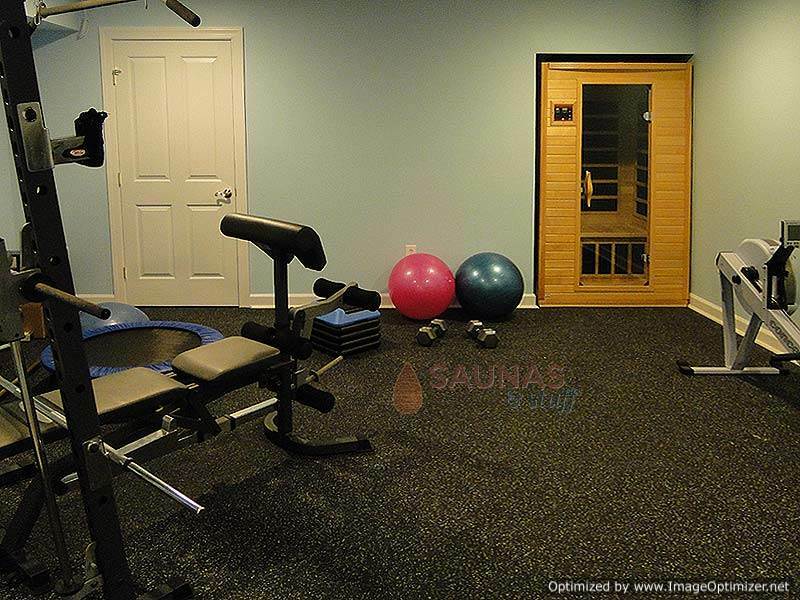 I put in our exercise room where it fit perfectly. 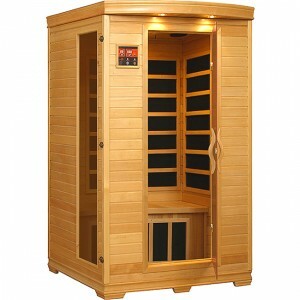 I use it almost every evening and feel great afterwards. 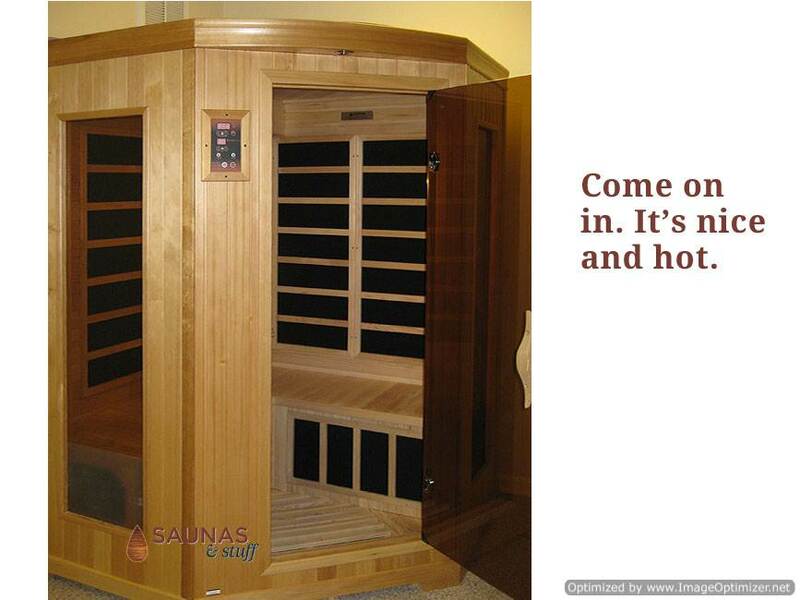 Hi Mike, we enjoy our sauna! I was in there twice already. Everything works well. The radio/CD-player is great. 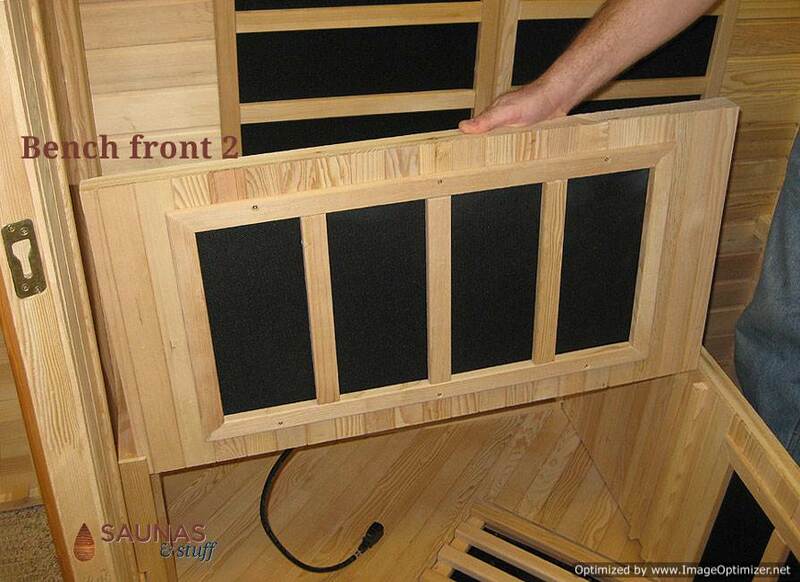 We were really surprised about the good sound. 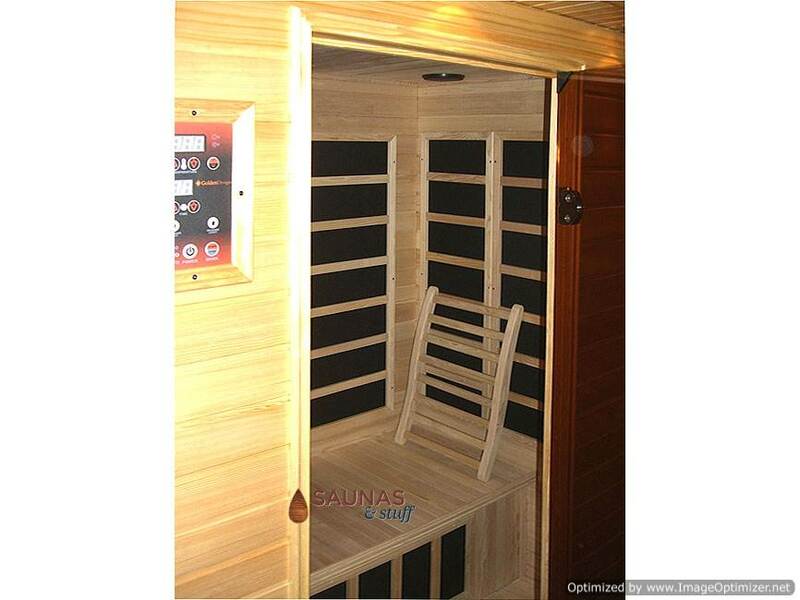 The sauna also has a magazine rack, towel holders and cup holder inside. 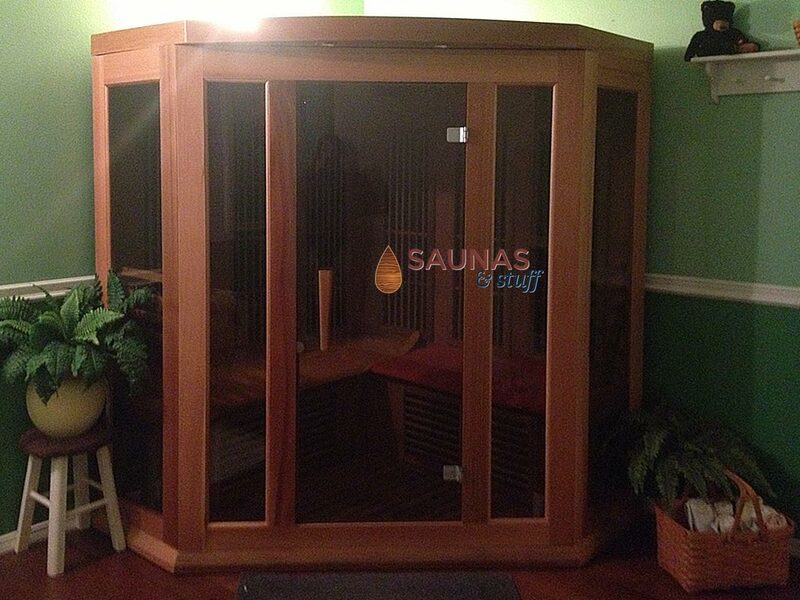 It took us (2 people) more than 1 1/2 hours, to assemble this big sauna! 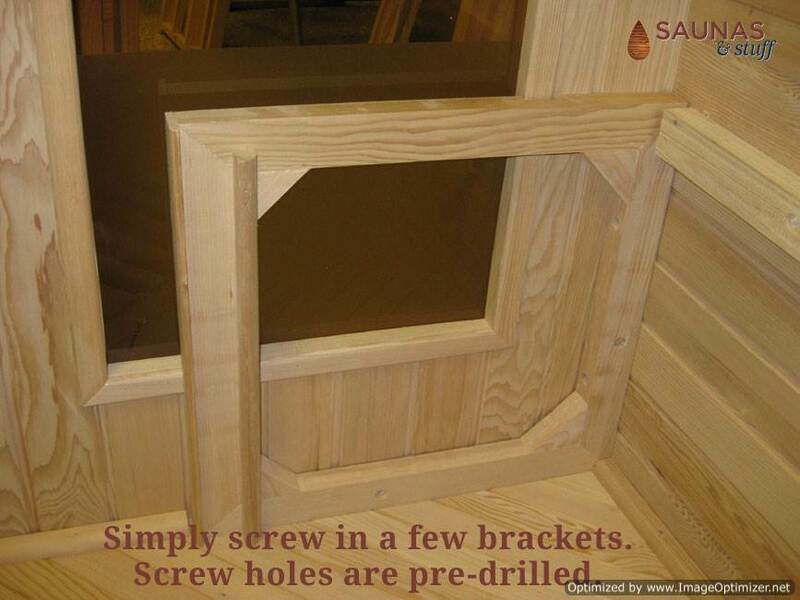 Just a suggestion: taking off the glass door (unscrew 4 screws, it is easy to do) was helpful in putting the last wall panel in place. 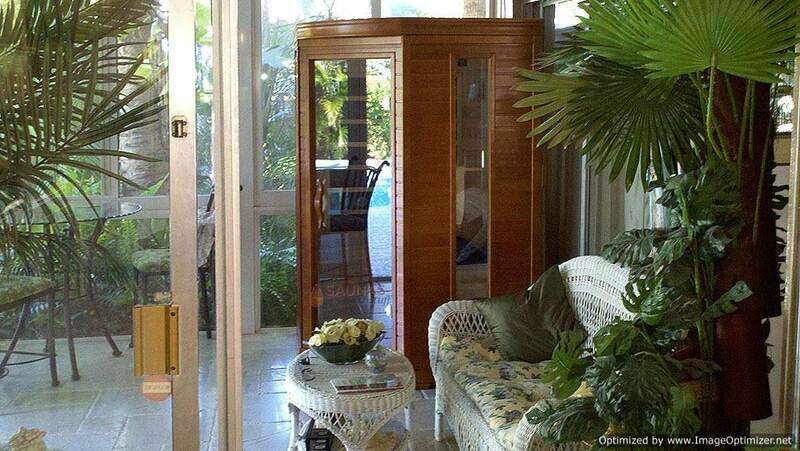 The panel was too heavy for me and my husband, with the glass door in it. Thank you for everything. A+ for your excellent customer service. Hey Mike, just wanted to loop back with you on our installation. With the expert help from my 14 y.o. 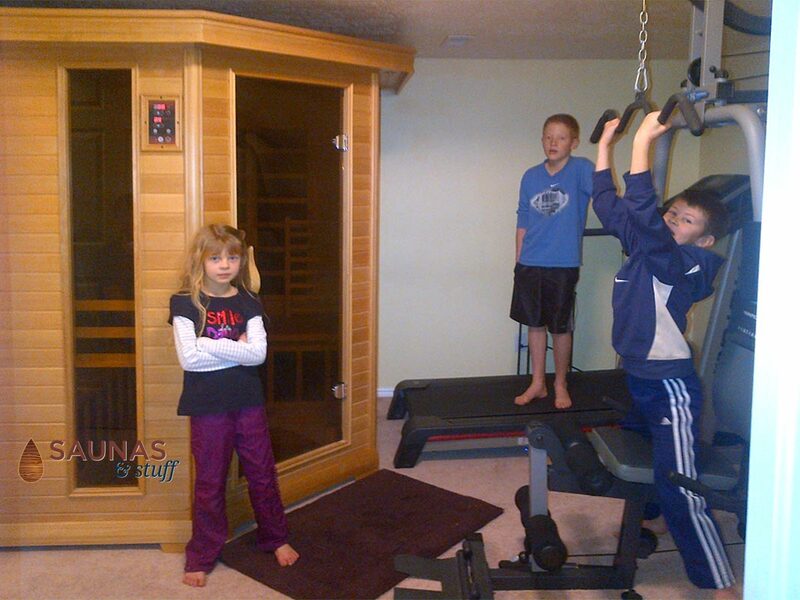 daughter, we were able to assemble the sauna and make it an integrated part of our home gym. 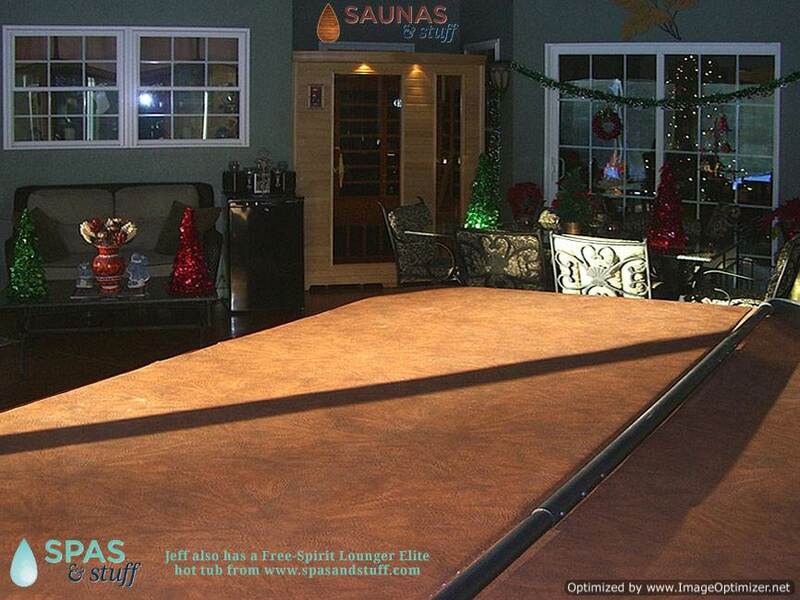 As you can see in the attached photo, we were able to erect it and then move it into the alcove intended for it. 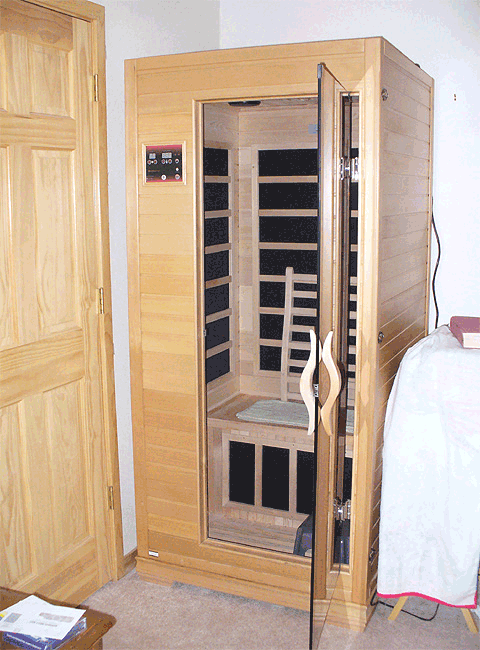 All turned out well and I was able to use the sauna last evening. It was great. 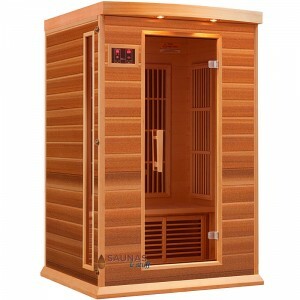 My wife, is looking forward to a session this evening. 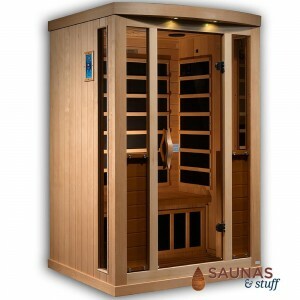 "The heater arrived very quickly and when we opened the box and saw the wood cabinet with the great Oak finish that looks like a piece of furniture we were thrilled. 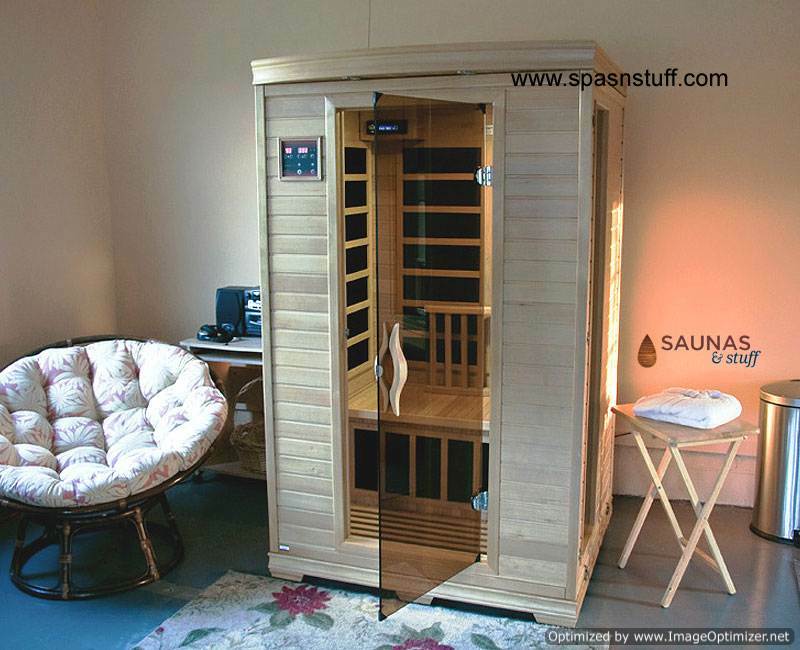 It works instantly, no warm up or anything. 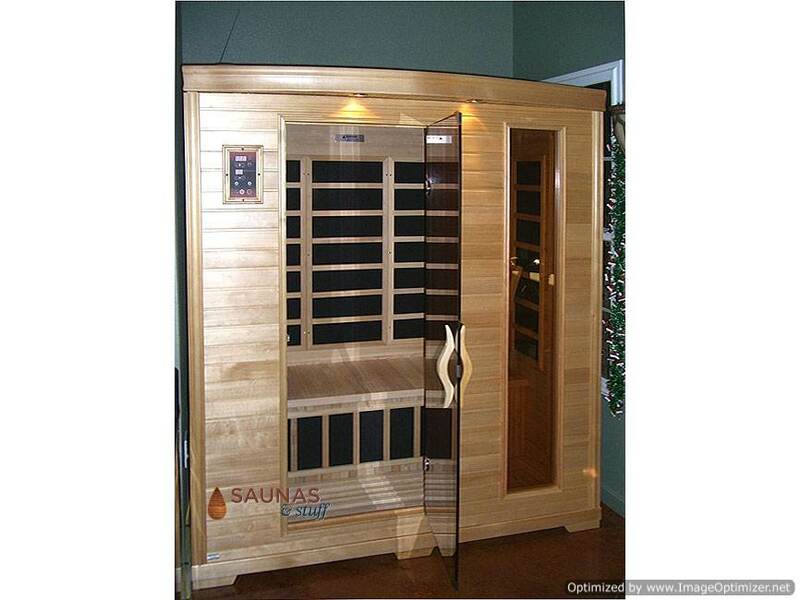 Turn it on and you're heating. 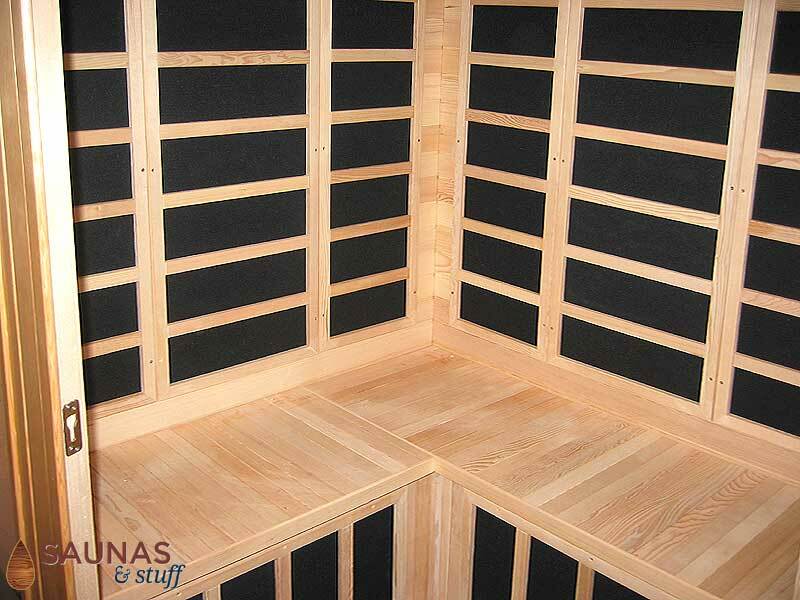 It takes up no space and it works great and very quiet. 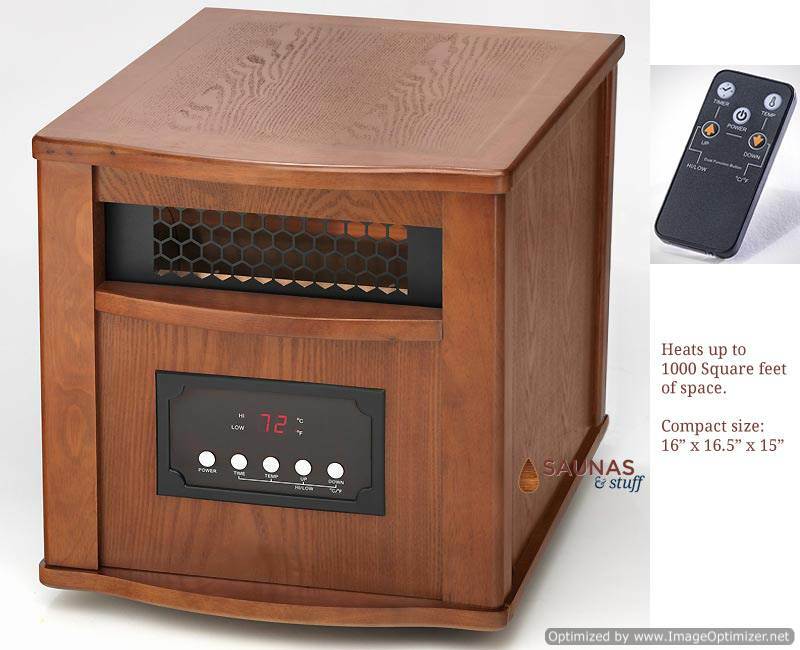 We are very pleased with this amazing little heater." 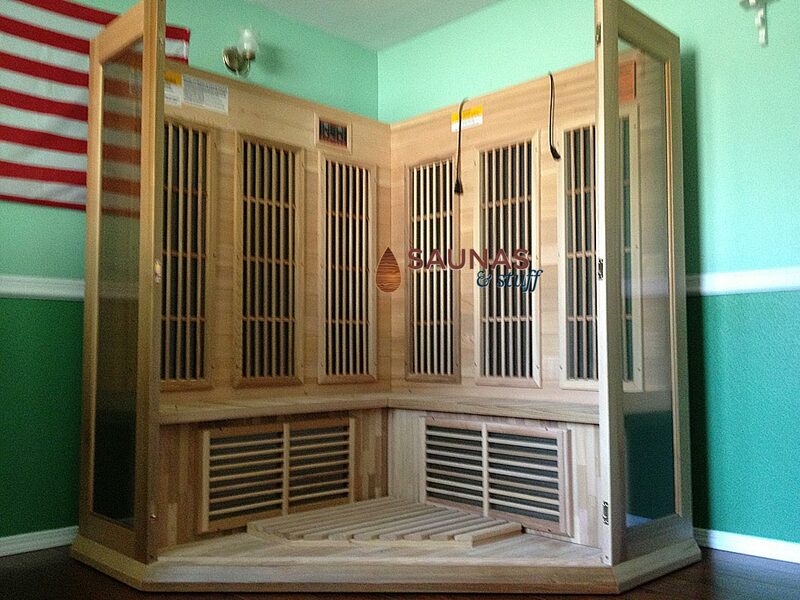 Hey Mike, the Sauna was delivered Monday all set up works great. Here are some pictures I hope they are good for you. 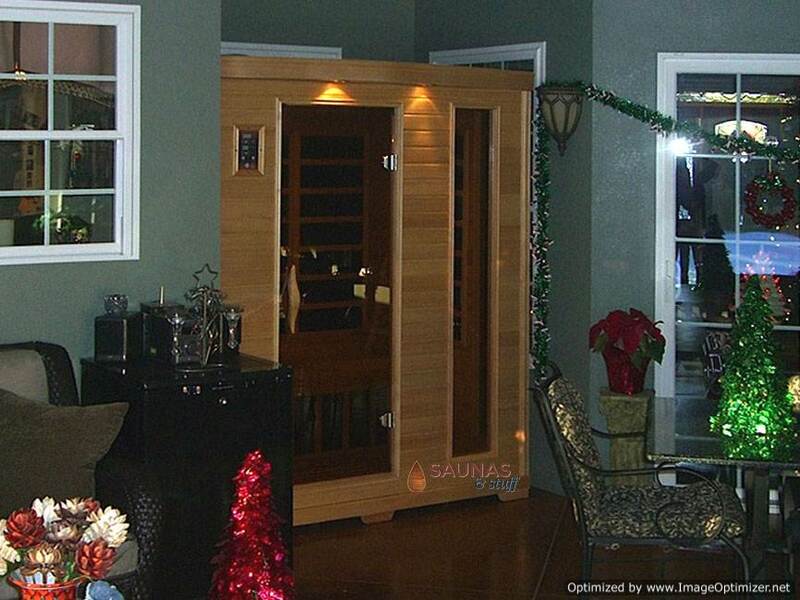 Dwight in Arkansas was kind enough to send a series of photos as he and his wife assembled their new corner sauna. 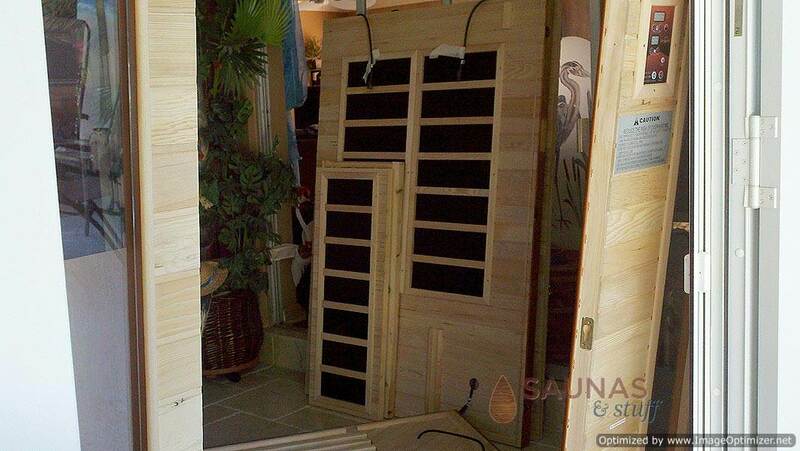 See how easy it is to assemble a portable infrared sauna kit in your own home. "Been in that puppy every day! 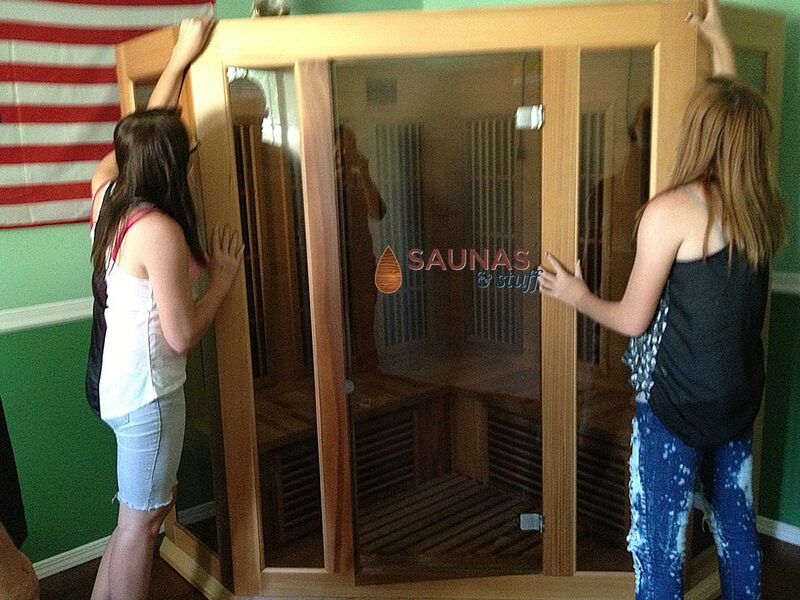 My 16 year old daughter enjoys it, as well. 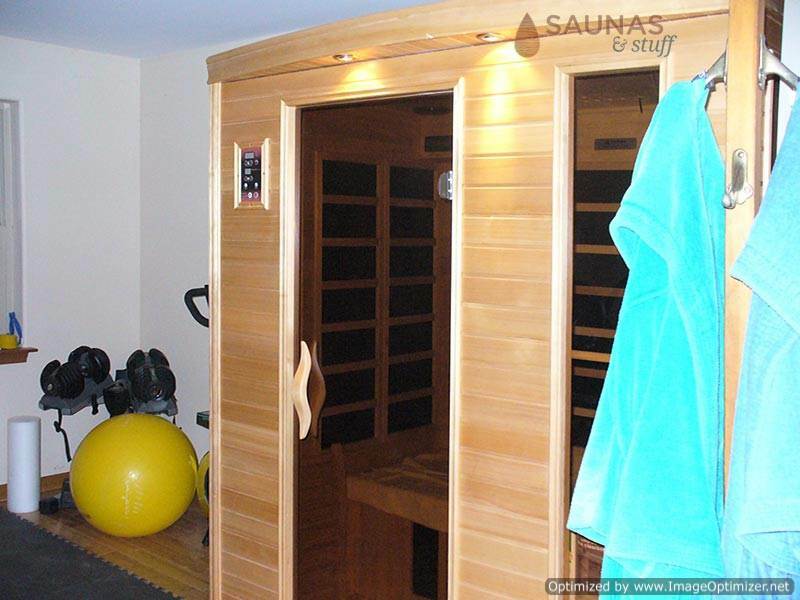 Her quote: "I didn't know that I could sweat that much!"" 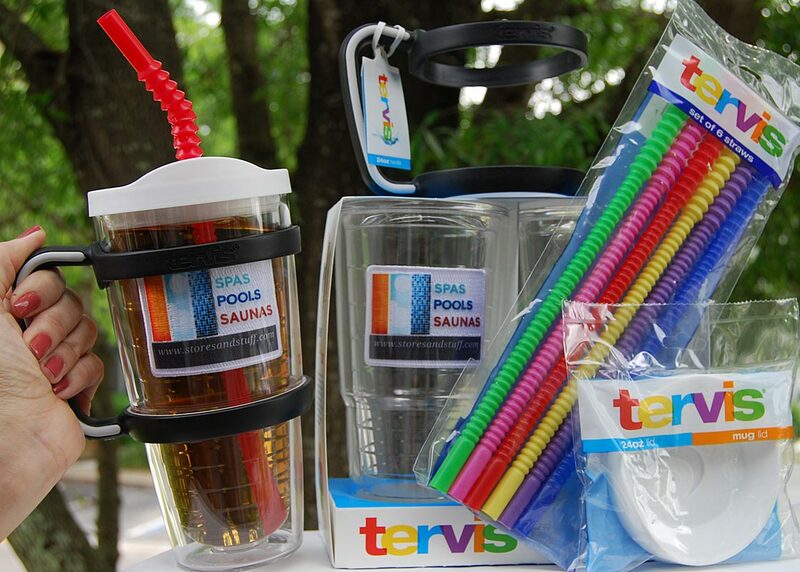 Mike, thanks for the additional tumblers and ice bucket. 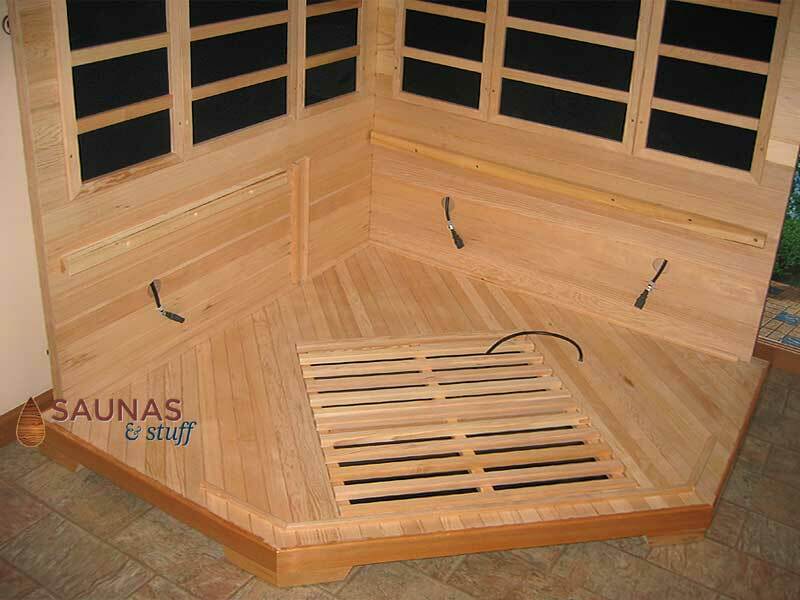 I will get you a picture of the hot tub open and running with the sauna in the back so you can entice owners of one of the items into getting the other. 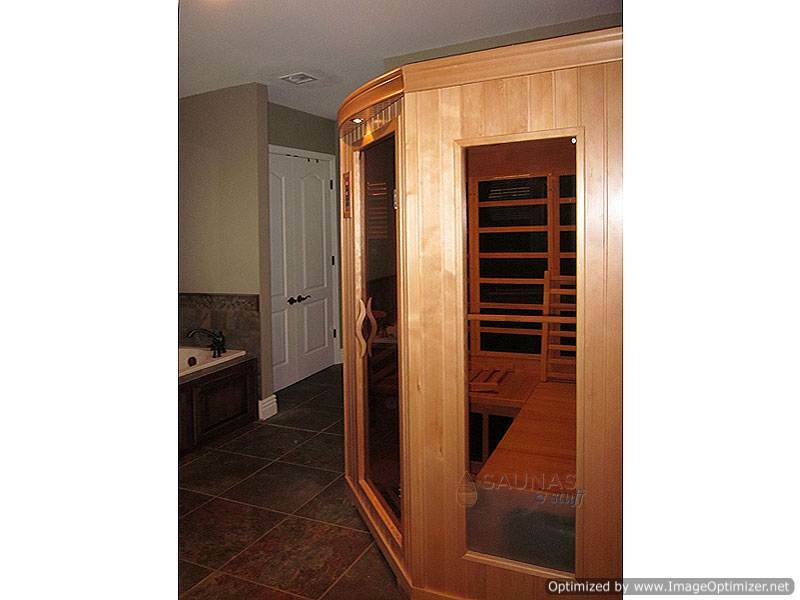 The wife took the dogs out for a walk and was back in the sauna when she got back. She loves it. Thanks for the Christmas wishes and right back at you. 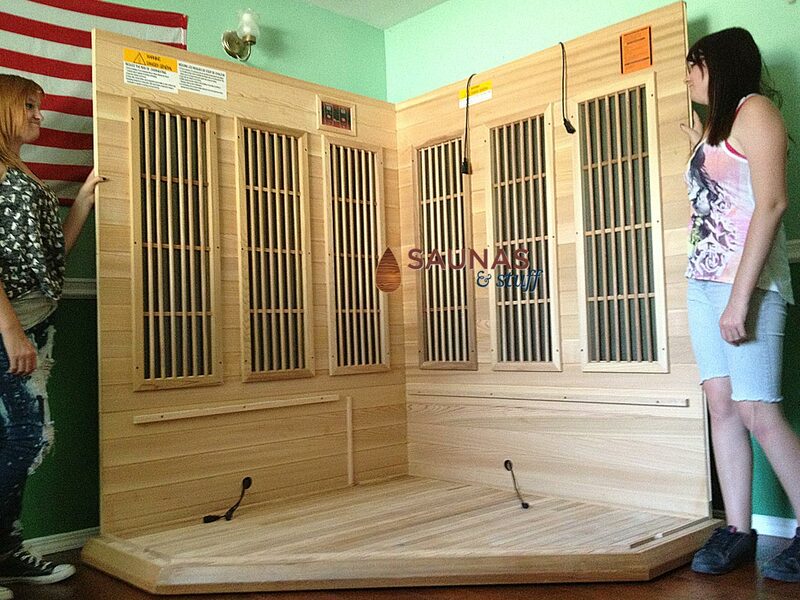 Hey Mike, Sauna arrived on day and time arranged. 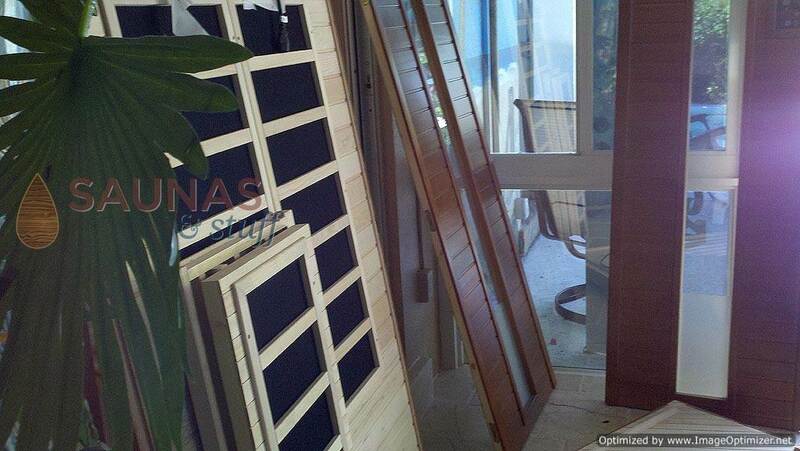 We unboxed and inventoried everything was there. 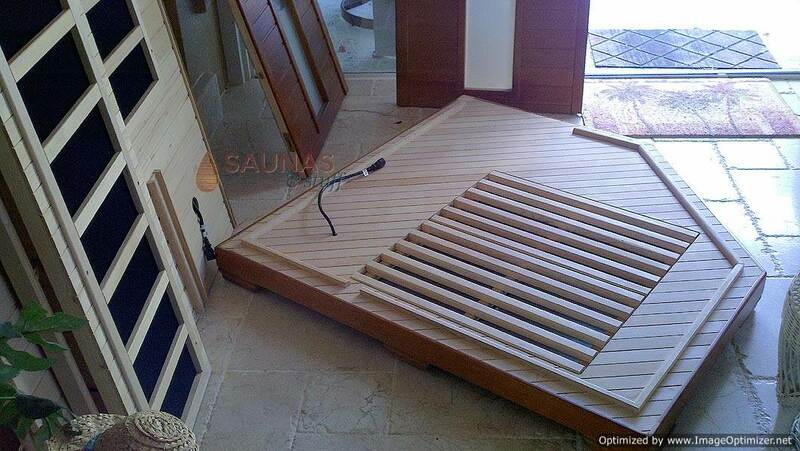 It was easy to install just followed the directions. I think we had it in place in about an hour. Thanks for your help. 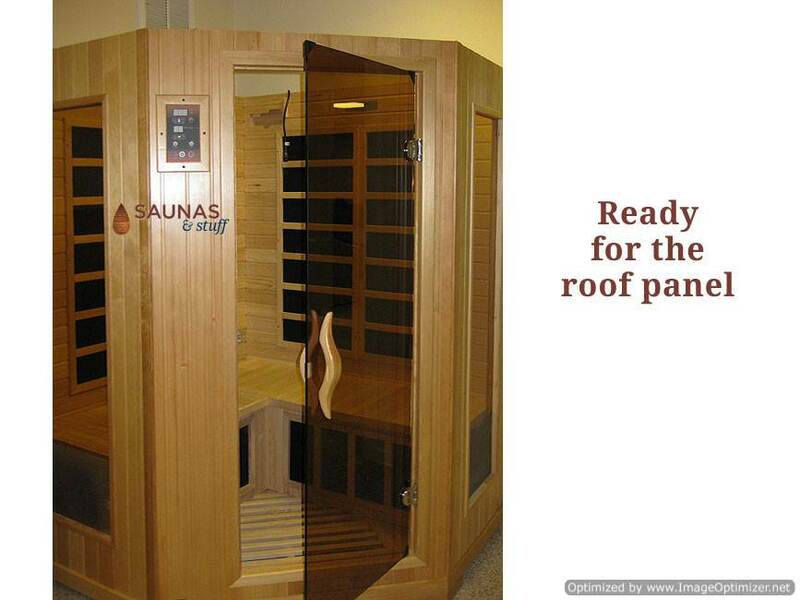 We have used the sauna twice already. 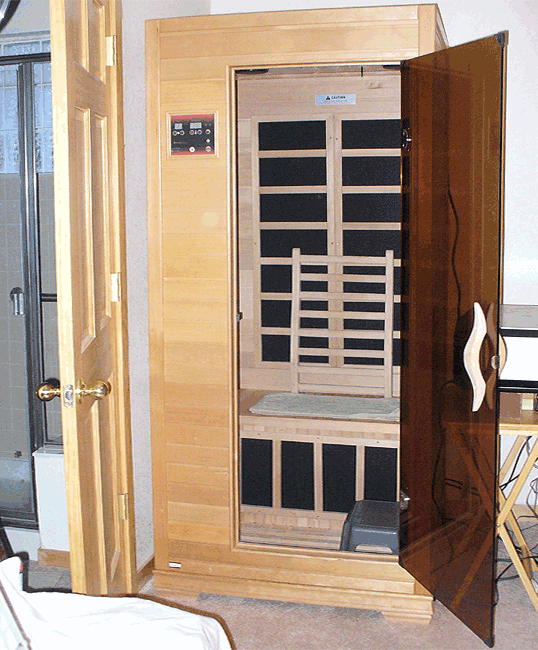 We are following the suggested time and temperature settings for older people since we are in that Senior stage of life. It works great. 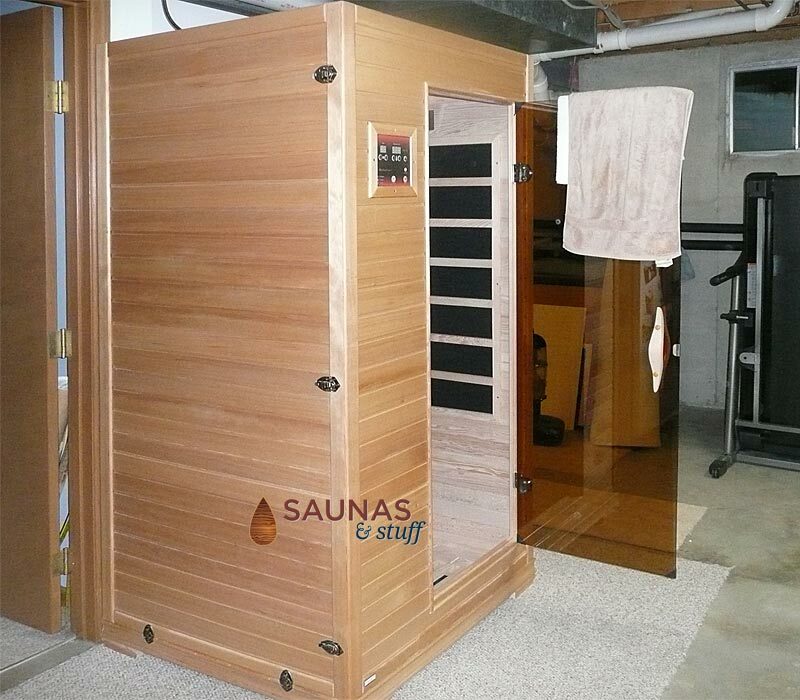 Hi Mike, Here are a couple of pictures of the sauna set up in my basement “Man Cave”. The unit is absolutely great. 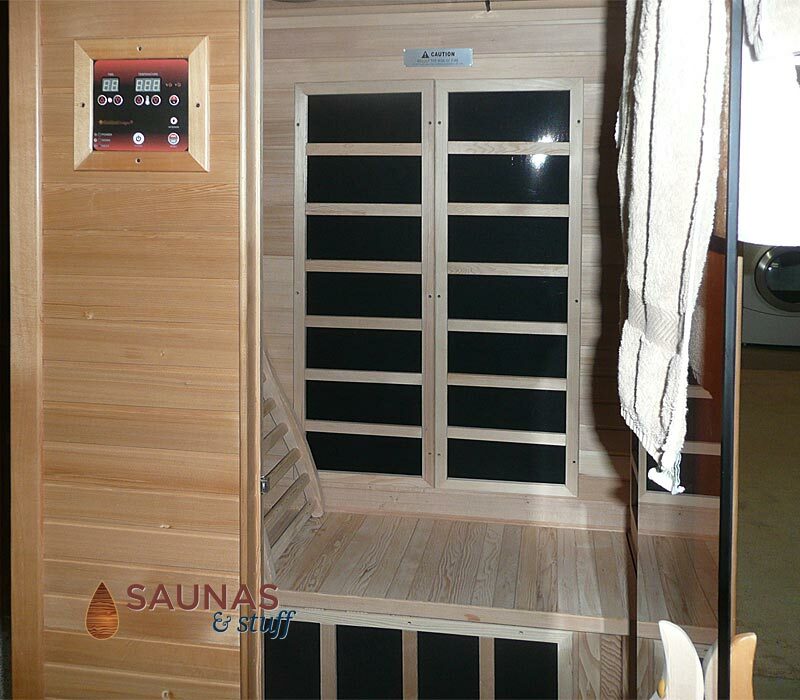 I was very impressed with the quality of the sauna as well as the ease of setup. It certainly does everything I expected of it. 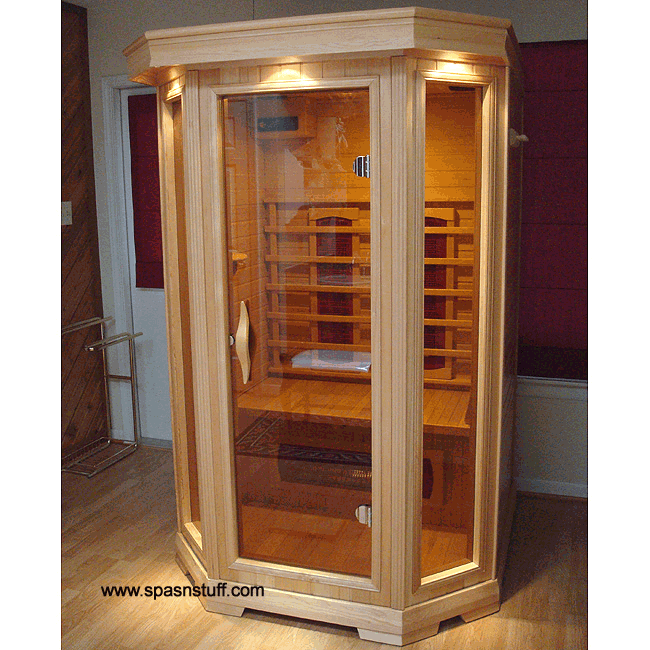 I am very happy with the unit as well as the customer service I have received. Hi Mike! 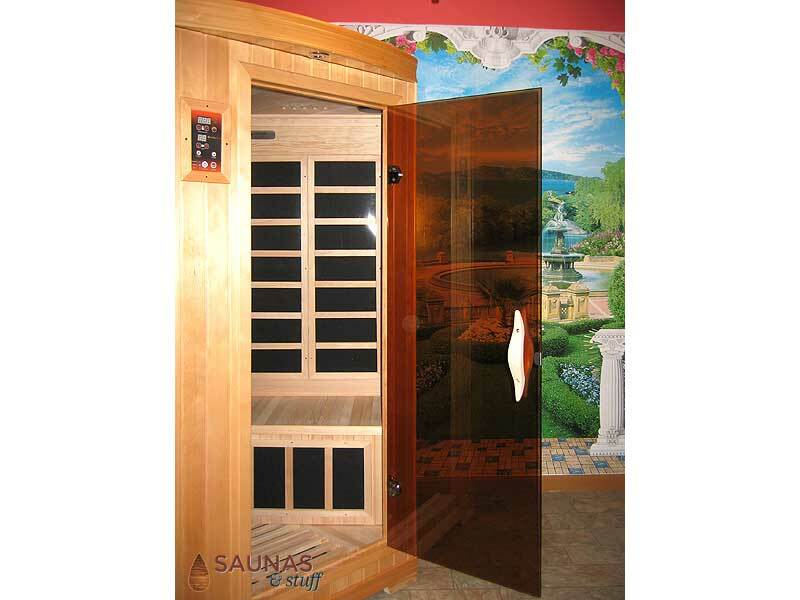 I can't tell you how much we are enjoying the spa and sauna we purchased from you. If you'll remember, Retta was involved in a car wreck, which was her "excuse" for us to purchase your products. 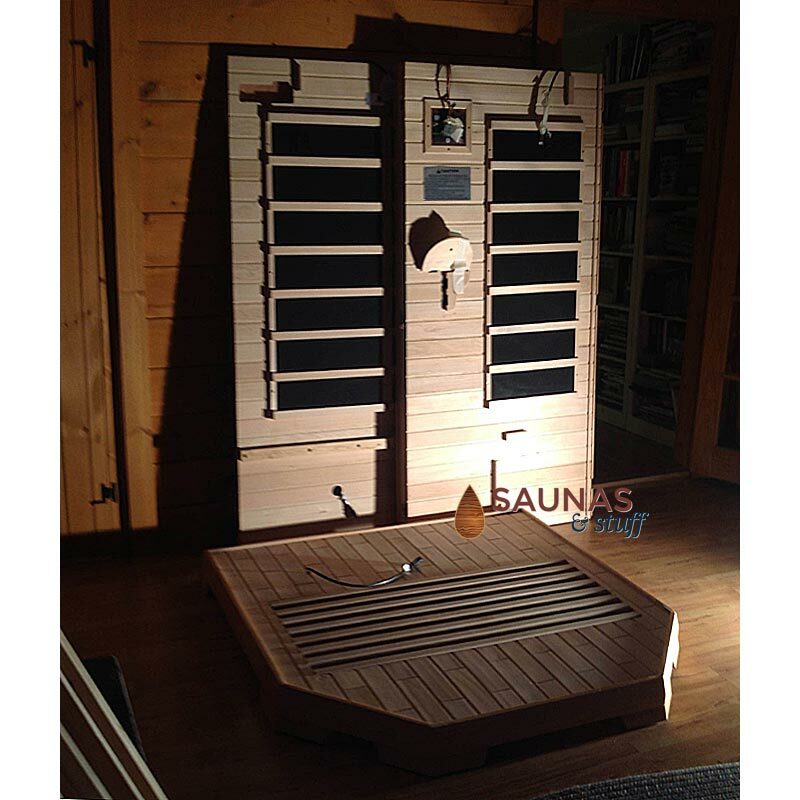 We don't need an excuse now that she is healed up to use the spa or sauna at least once a day, if not twice! Heck, I even built a room indoors specifically to put both of them in. 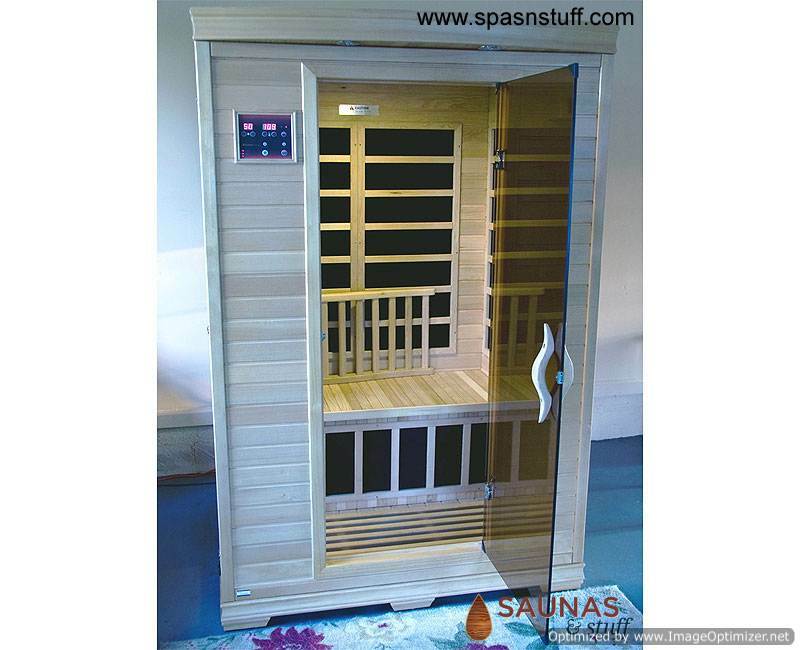 Good service, good products. It was a pleasure doing business with ya! Come see us! Pat and Retta from Cross Plains Texas (near Abilene and Dallas Fort Worth, TX). 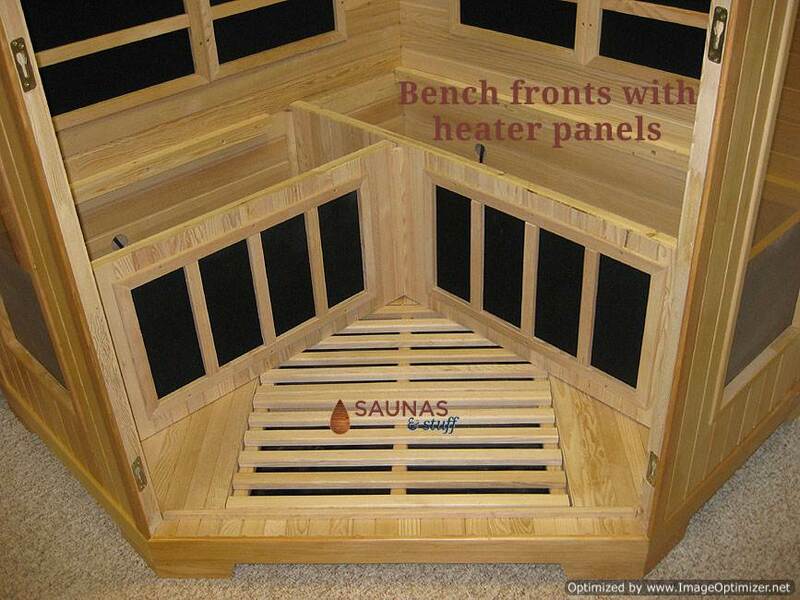 FIR Sauna received, assembled, and seems to be working well. 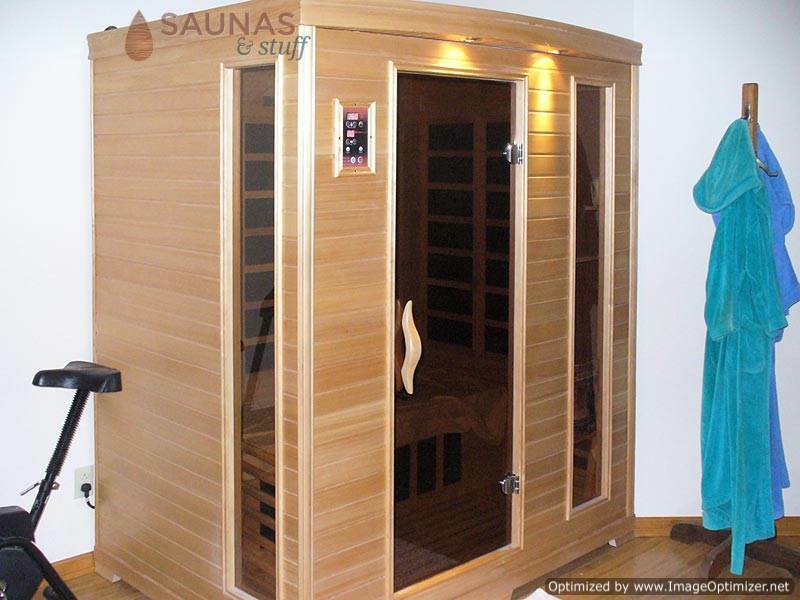 My wife does winter swimming in our unheated pool, so this is to warm her up before and afterwards. 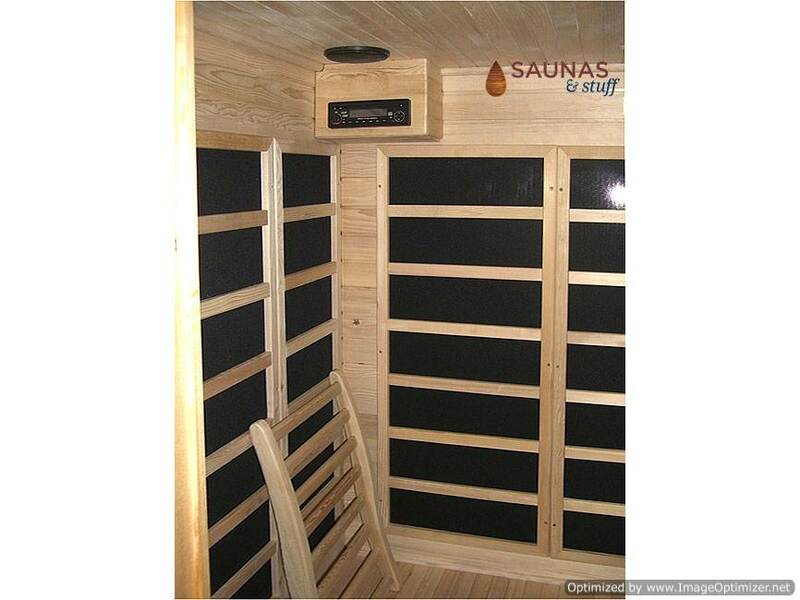 I have attached a picture of the sauna. We are enjoying it. 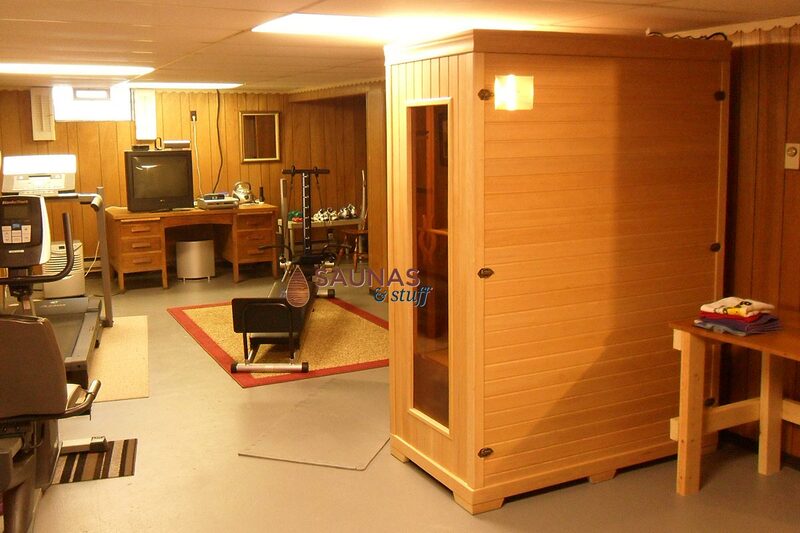 Here are some photos of the sauna and the room I built. 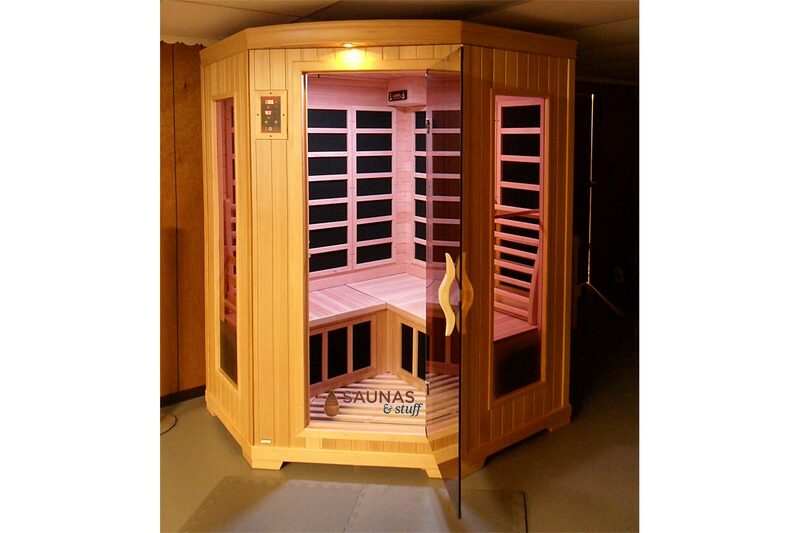 Joe in Parma, OH (near Cleveland) purchased one of our 3 Person Infrared Saunas. 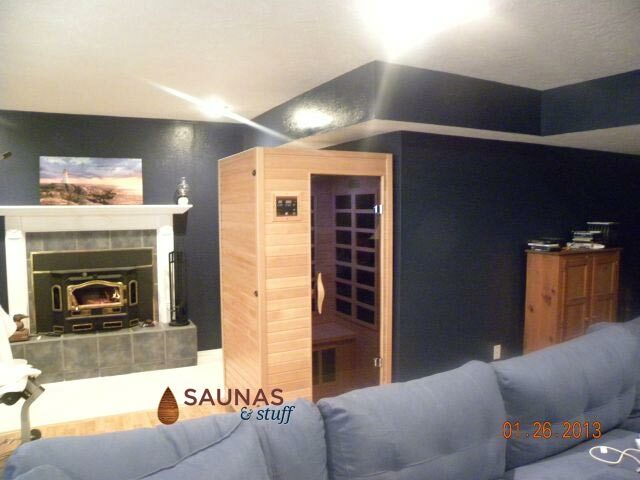 He placed it at the end of a room and constructed walls and a ceiling to match the sauna. 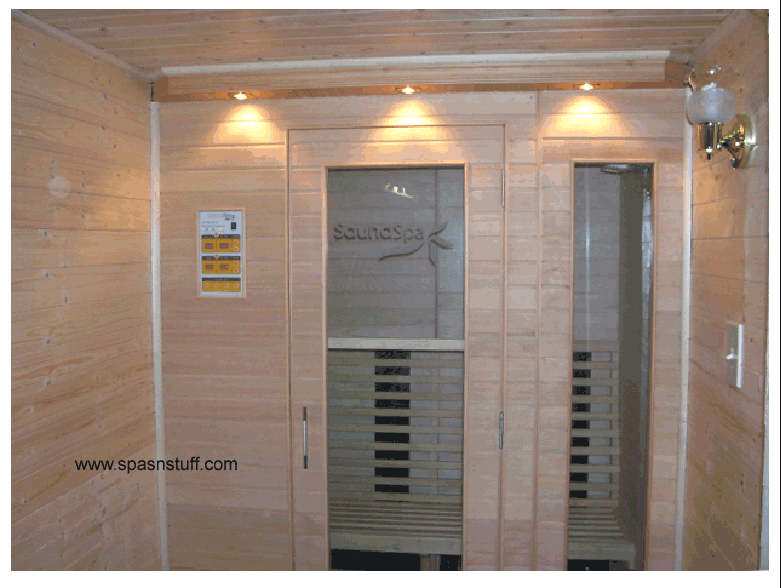 The result is very attractive, and you would hardly know it was a kit sauna. 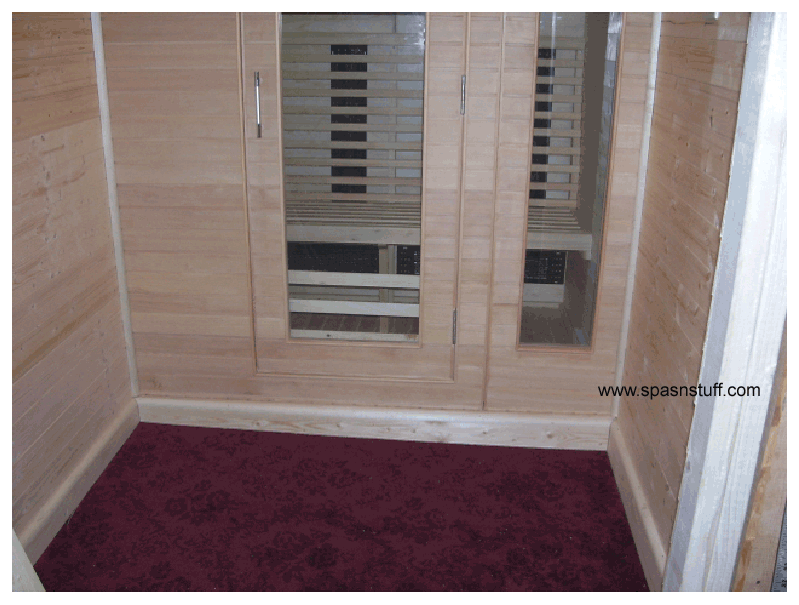 Beautiful job! Thanks Mike for the excellent customer service. 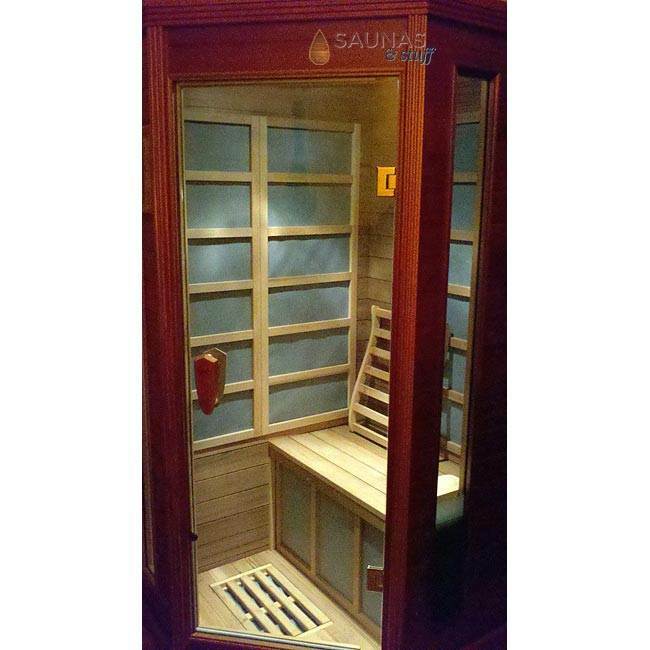 We use our sauna almost daily. 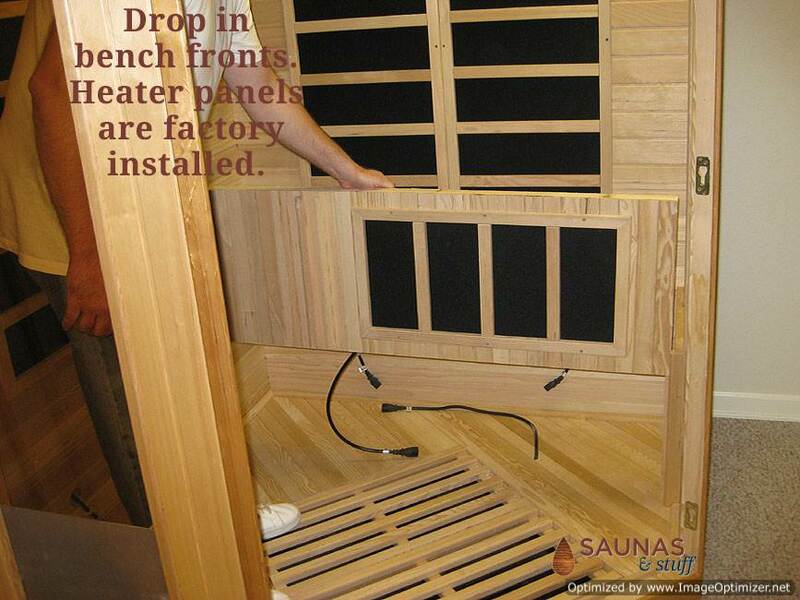 I didn't expect the sauna to be so well constructed and so easy to put together. 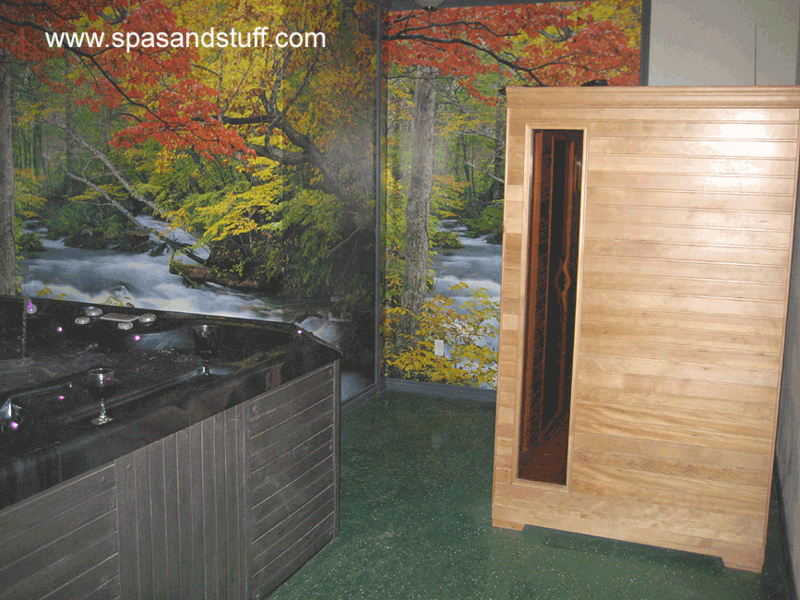 I am telling all my friends and family about spas n stuff. I'll be sending some more pictures later.